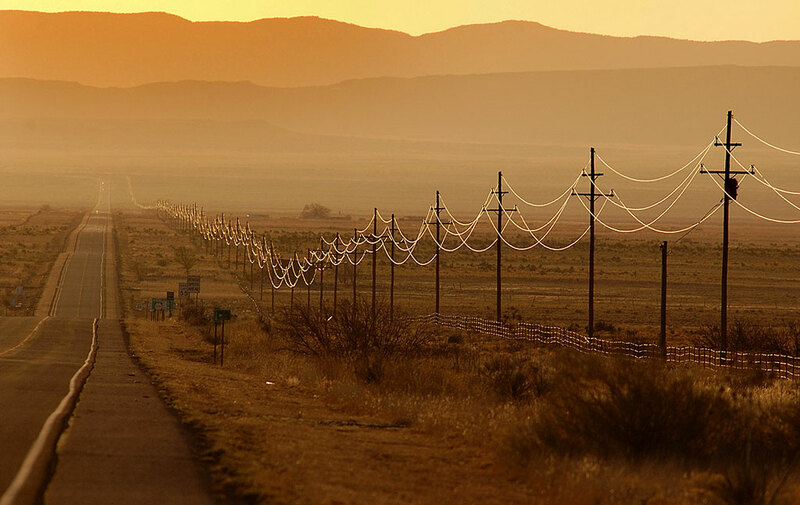 The sun rises on power lines on U.S. 380 in New Mexico’s forbidding Journada del Muerto Desert, home of the Trinity site where the first atomic bomb was tested. I drove to my usual first night stop, Farmington, New Mexico. Generally speaking, this 11-hour drive is beautiful and interesting, but uses divided highways, so it is more of a utility drive. With radio and CDs, plus frequent phone calls to my wife and friends, the time slides by. I drove from Farmington northwest, shooting along the way. 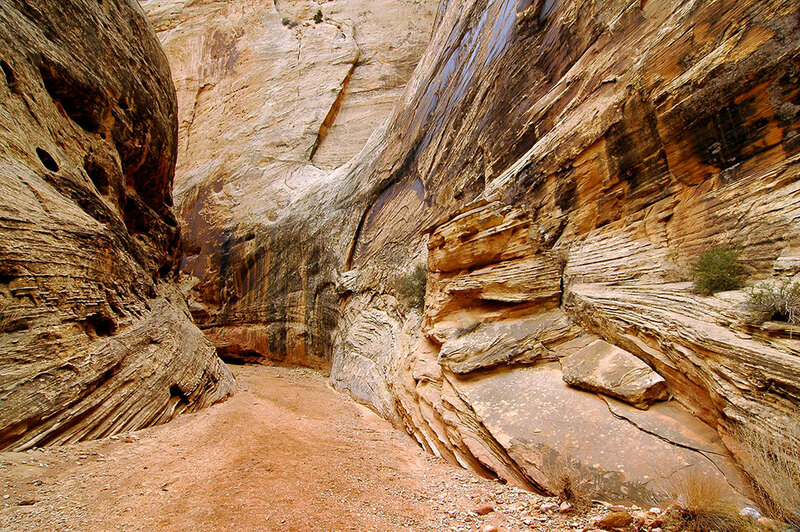 Utah 95 intersects with the legendary White Canyon, portions of which are notoriously difficult and dangerous, but very popular, canyoneering destinations. 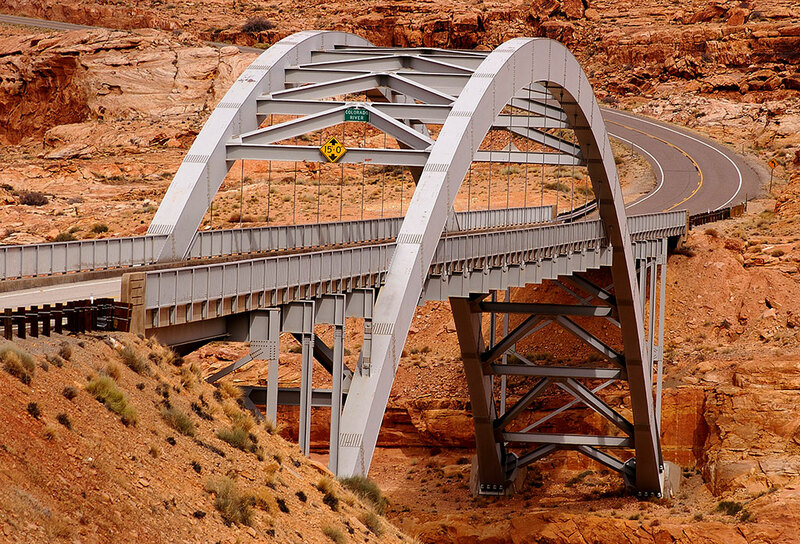 I felt inspired to photograph the steel bridge over Glen Canyon at Hite Crossing. I prowled along the banks of the Colorado to get lower views of the bridge. 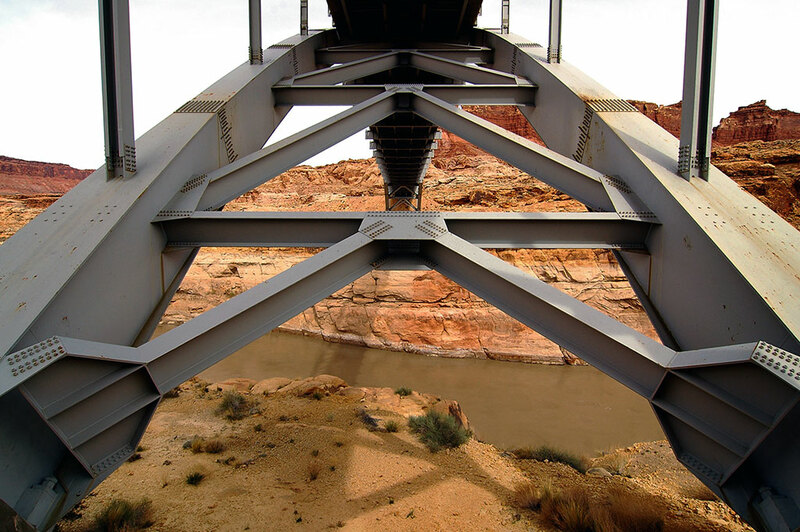 I got under the bridge at Hite Crossing to get this image of the beautiful lines of the steel construction. It was apparent from tracks that I wasn’t the first to think of this. 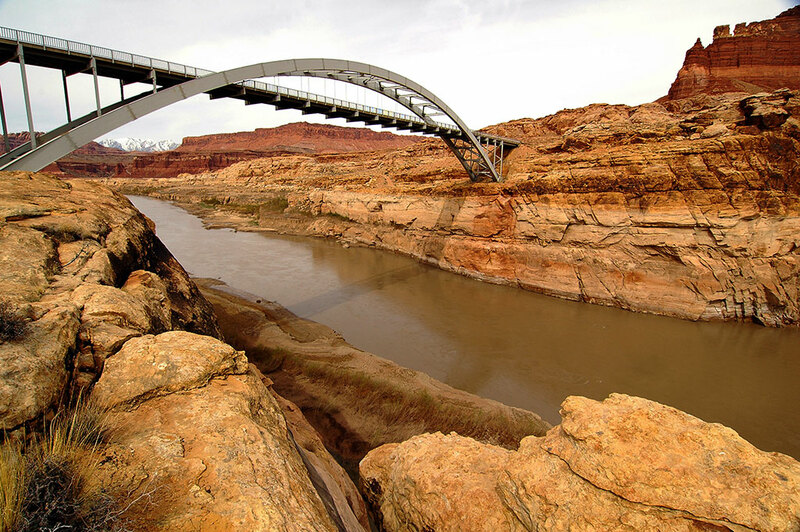 This stunning view of the Colorado River with the Henry Mountains in the distance was made from Hite Crossing. Near the center of the frame is the highway. 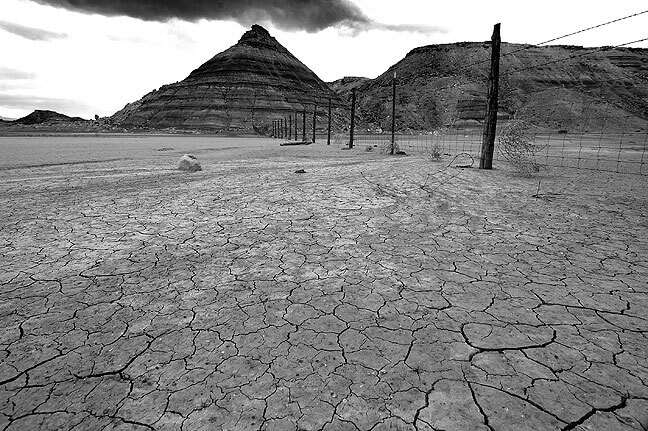 Glen Canyon is reduced to mudflats where Lake Powell was at one time. 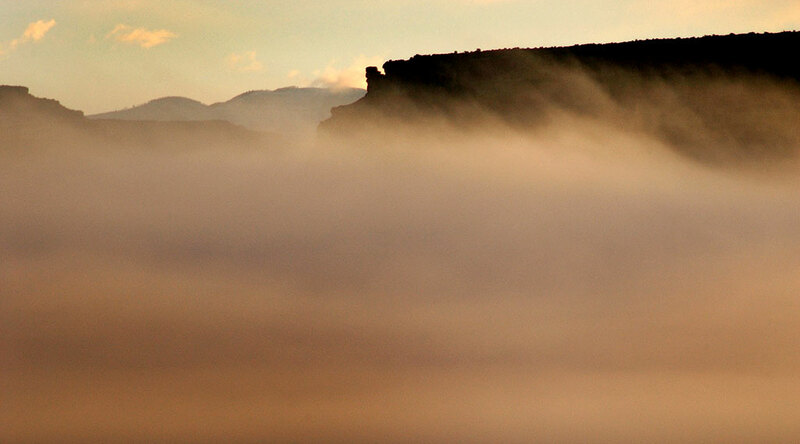 This image, made near Hite Crossing, shows sandstone cliffs set against the Henry Mountains. 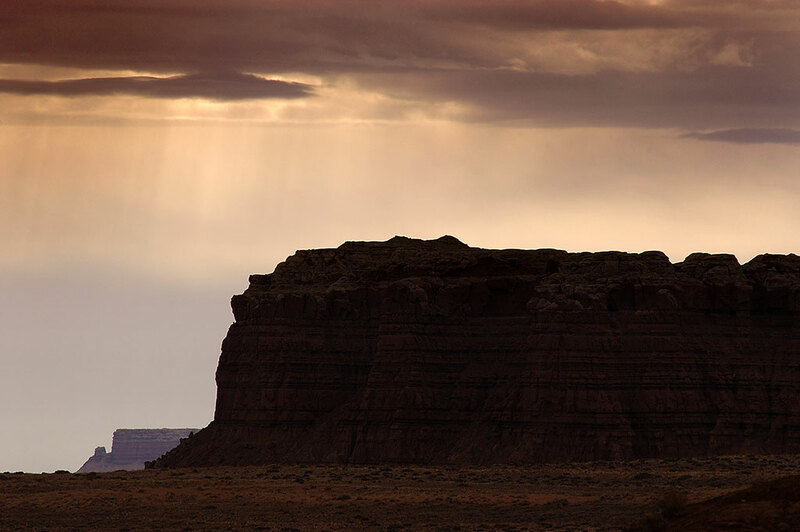 I arrived at the Horseshoe Canyon detachment of Canyonlands National Park by 1 p.m. The sky above Horseshoe Canyon was clear and blue when I started my hike down toward The Great Gallery. 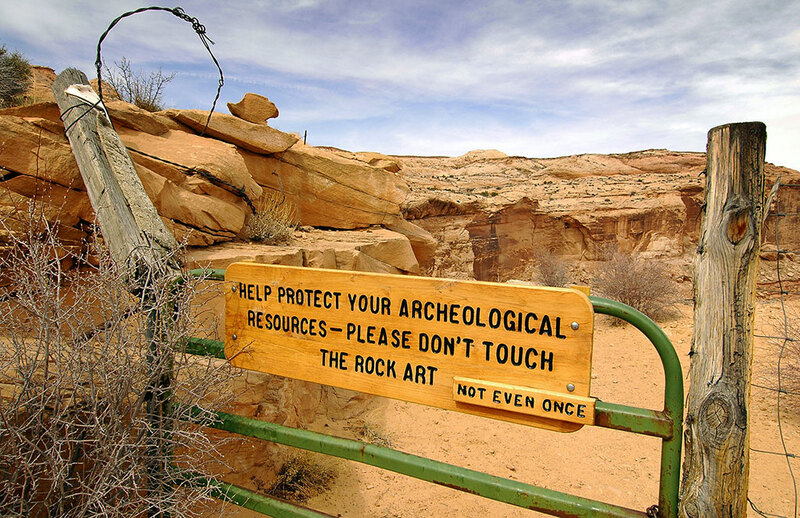 Just a few steps down the trail at Horseshoe Canyon is this sign. As the sky got more grey and I ran across this abandoned ranch equipment, I decided to shoot in black-and-white. 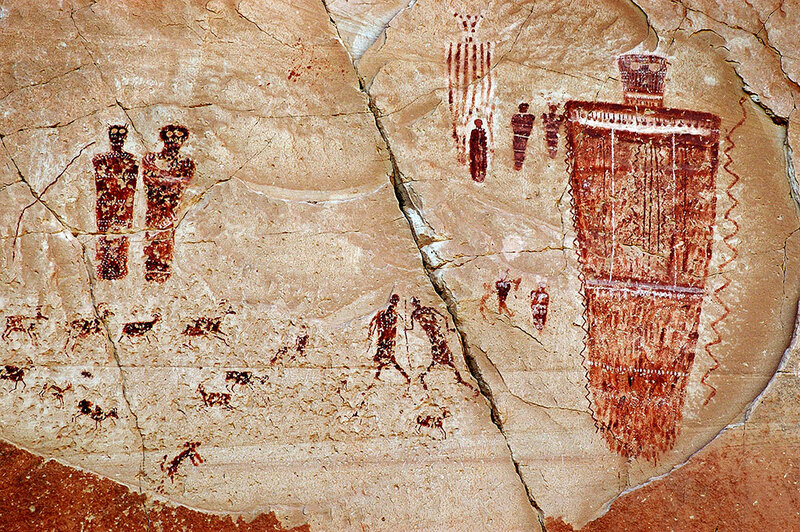 Your host poses for a photo at The Great Gallery in Horseshoe Canyon. 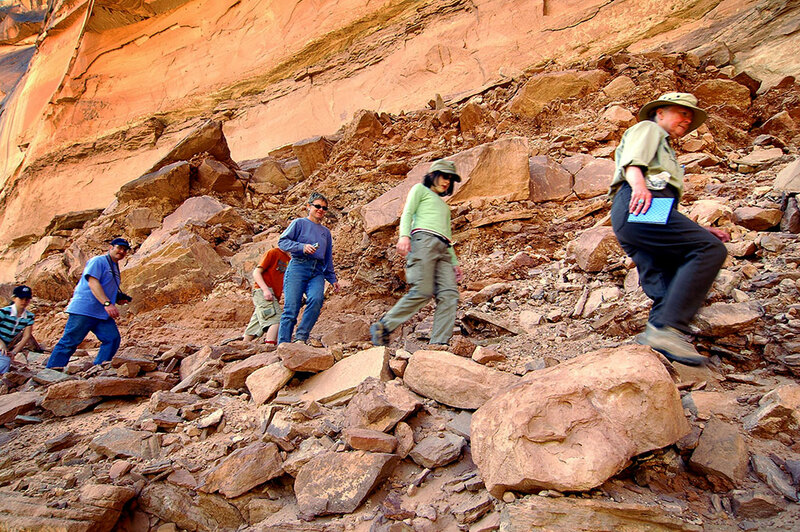 The 3.5-mile hike down and into Horseshoe Canyon is beautiful. 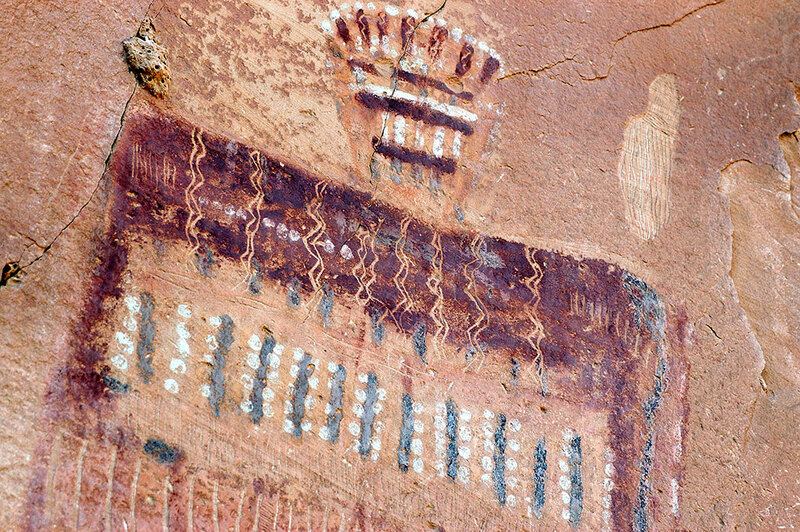 There are pictograph panels all along the bottom of the canyon, culminating in the Great Gallery, an icon of the ancestral Puebloans. 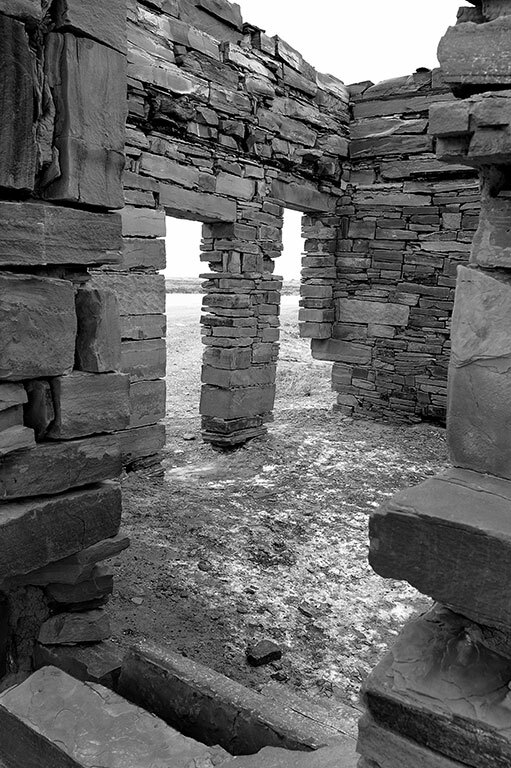 The central figure of The Great Gallery stand at the end of the Horseshoe Canyon trail. 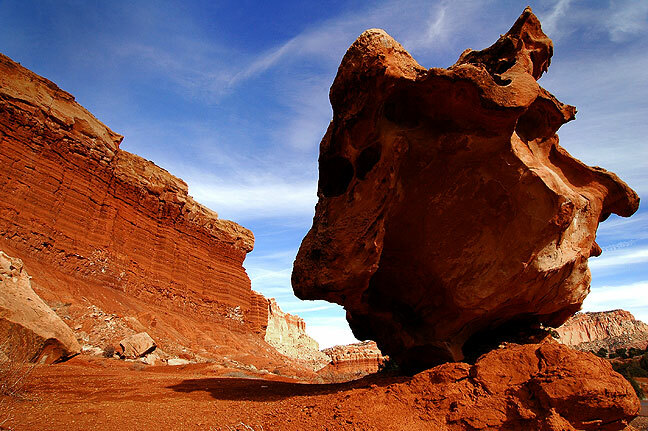 It was near this the Great Gallery that injured canyoneer Aron Ralston, who had amputated his own arm after four days pinned by a boulder, asked a Dutch family for a medical helicopter. This broader view of the Great Gallery gives a sense of scale. 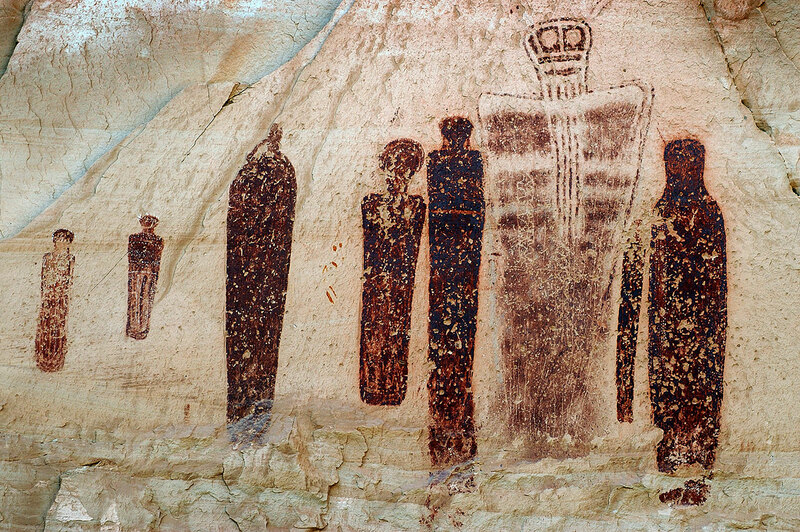 The tallest figures are smaller than modern humans, standing about five feet tall. A volunteer was on hand to take visitors closer to the figures, and, no doubt, the prevent vandalism. 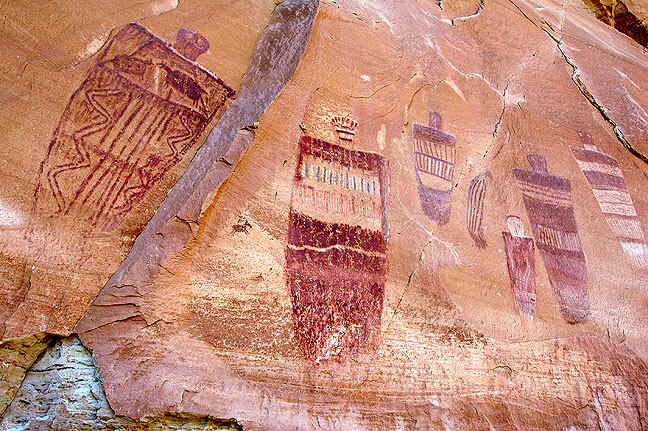 The Great Gallery is a complex, well-preserved pictograph collection. There are a number of theories and speculations about what the figures of the galleries of the Southwest, and of the Great Gallery, depict, but after discussing it with my wife, we concluded they probably represent burial shrouds. 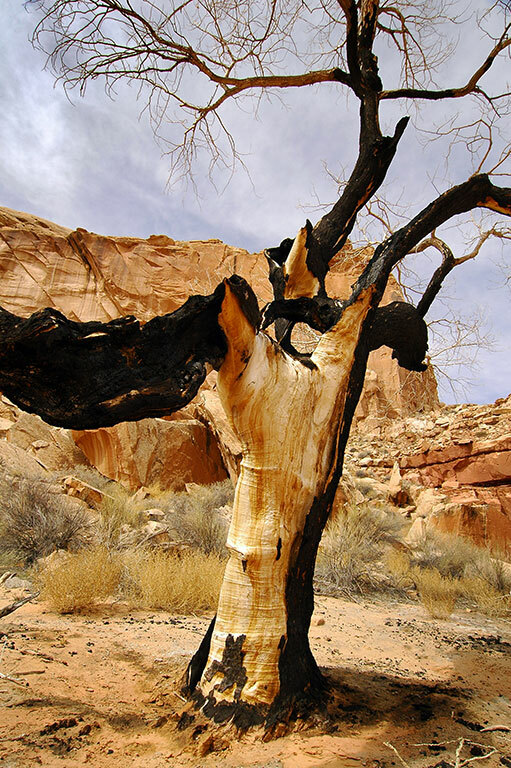 Finding my way back to the trail head in Horseshoe Canyon, I came across this tree that appeared to have been struck by lightning. 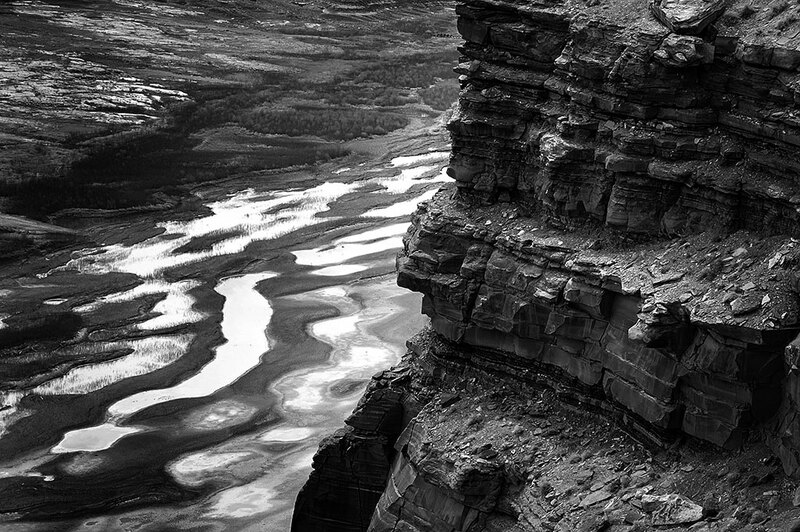 It rained in the San Rafael Swell, where I had hoped to hike, so instead I drove to Capitol Reef National Park, making some decent images along the way. 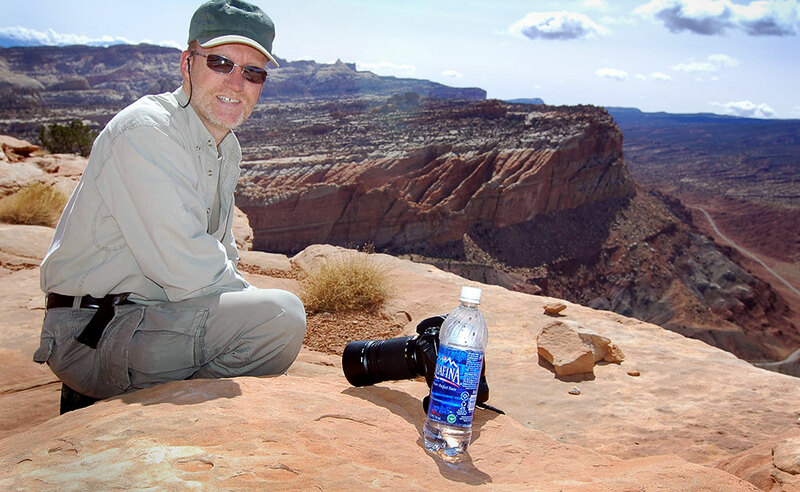 I mostly drove and scouted at Capitol Reef. 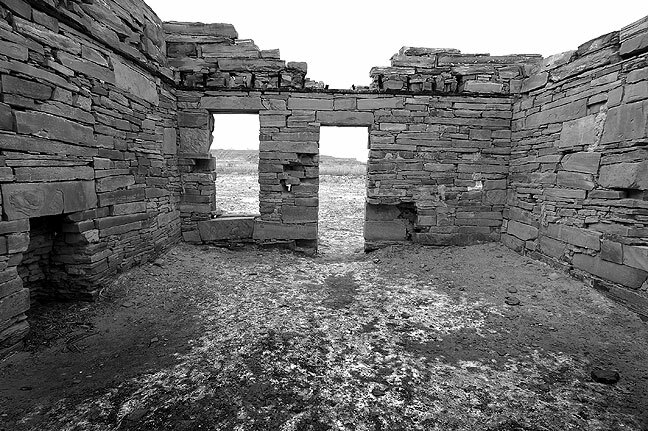 I found this abandoned brick structure near Caineville, Utah, on my way to Capitol Reef. 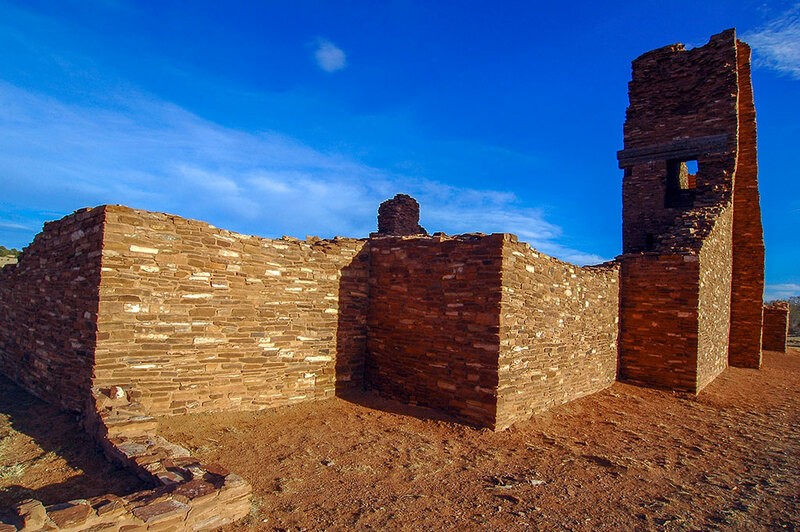 The contours of this mysterious brick building near Cainville in southern Utah make it a perfect match for the surrounding landscape. The last time I drove through the area in 2012, someone had erected a high chain link fence around this brick structure, ruining any possibility of photographing it again. My guess would be that the fence was intended to protect it from vandals, which is a shame. 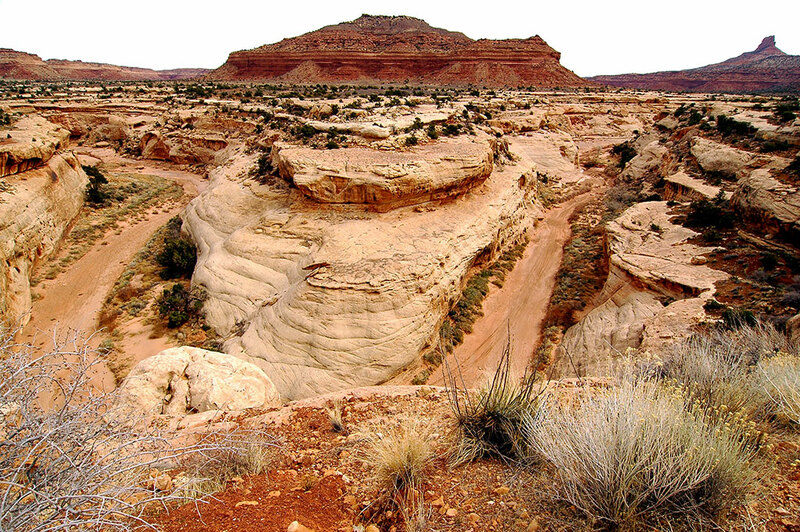 This feature is between Hanksville and Caineville on Utah 24. This brick building, whatever its history, is beautifully constructed. 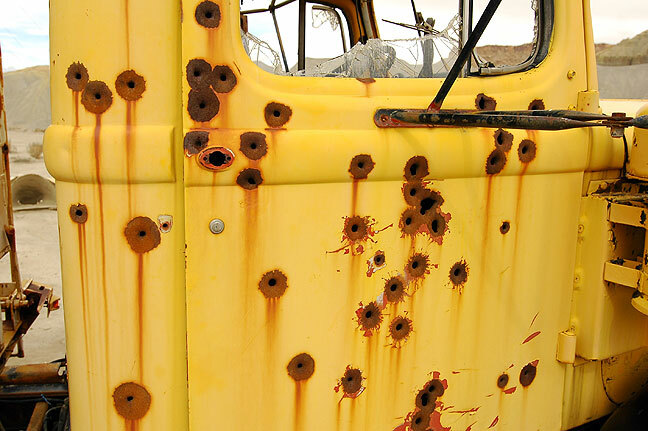 This abandoned cement mixer on Utah highway 24 is used as a shooting target, billboard, and graffiti panel. 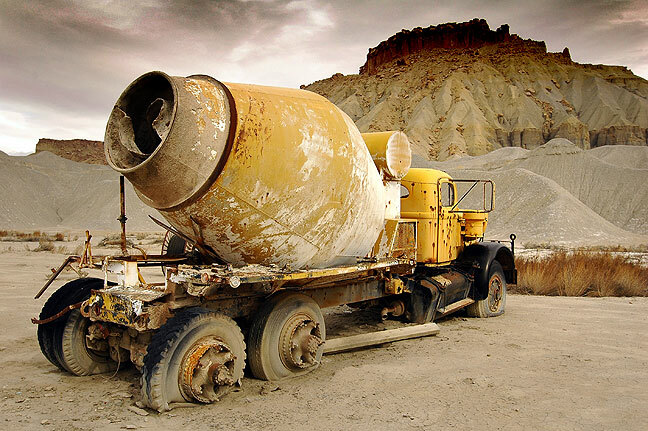 Riddled with bullet holes and sometimes spray painted with graffiti or political slogans, this abandoned cement mixer sits just east of Caineville, Utah. 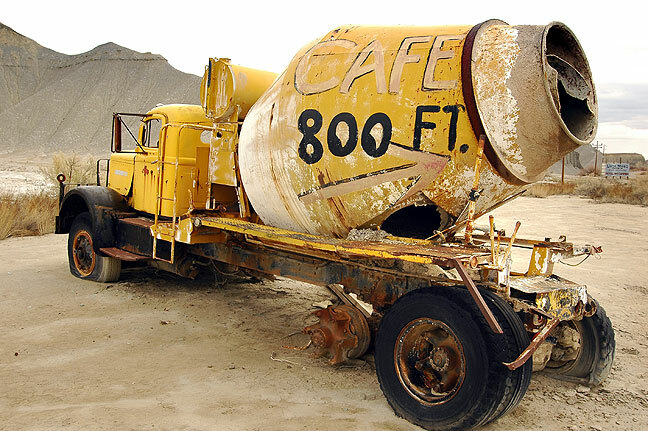 The “Café 800 ft.” tag on this abandoned cement mixer is for Caineville, Utah’s Luna Mesa Café. 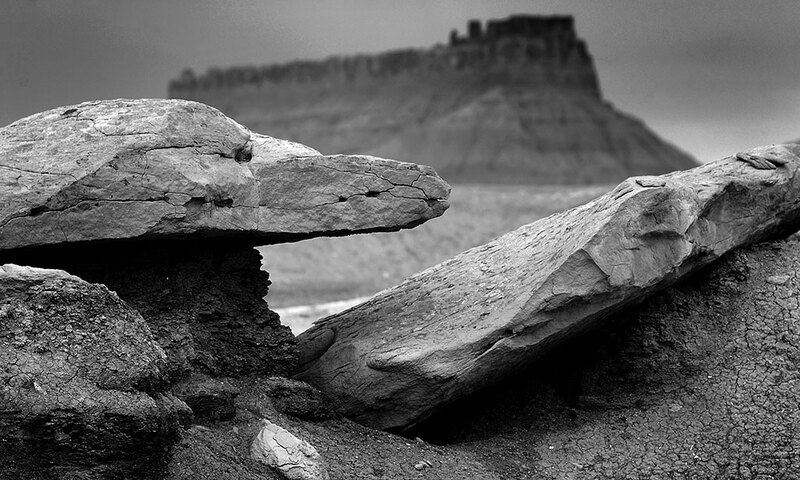 I made this image while traveling along Utah 24 near Goblin Valley. 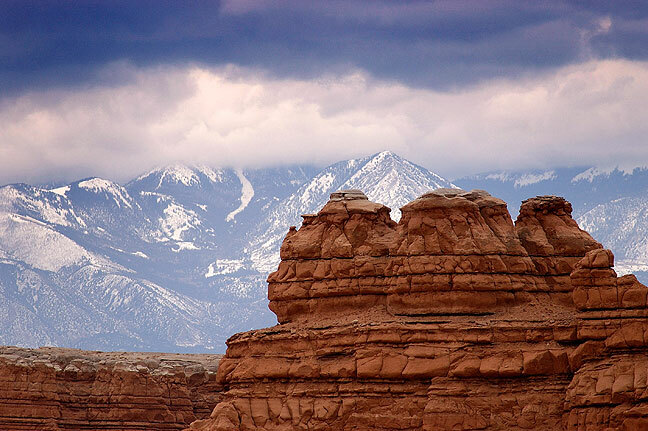 Brooding clouds hand over towering hoodoos and the Henry Mountains on Utah highway 24. 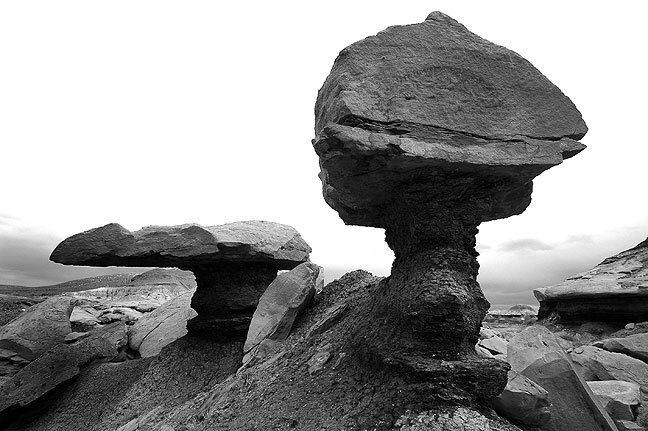 With the rain came very subdued light, so I tried to concentrate on shape and shadow, like this hoodoo in the San Rafael Desert. 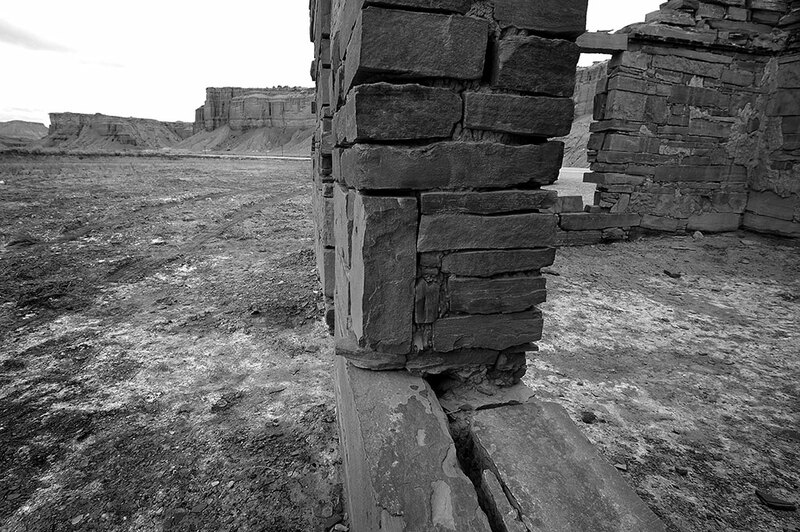 Slabs of stone are set against a background of Factory Butte on my route back toward Green River. Patches of snow are visible in this cold image of the desert. 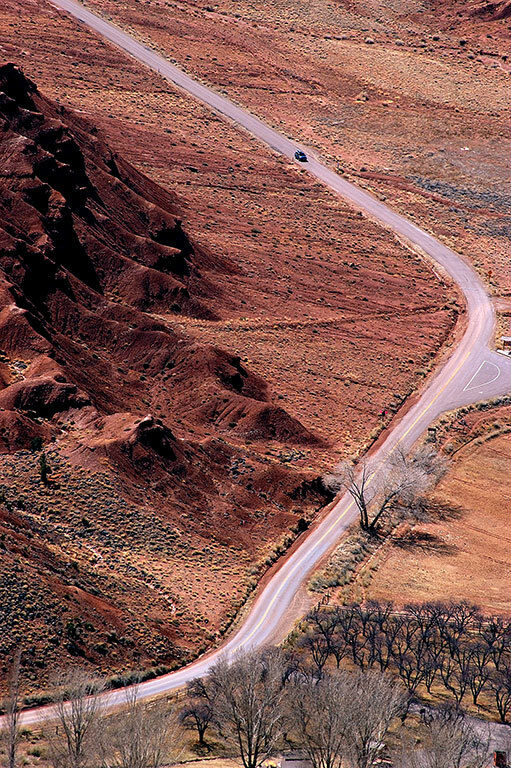 On the way back to Green River, I photographed this playa along Utah 24 near the junction with Interstate 70. 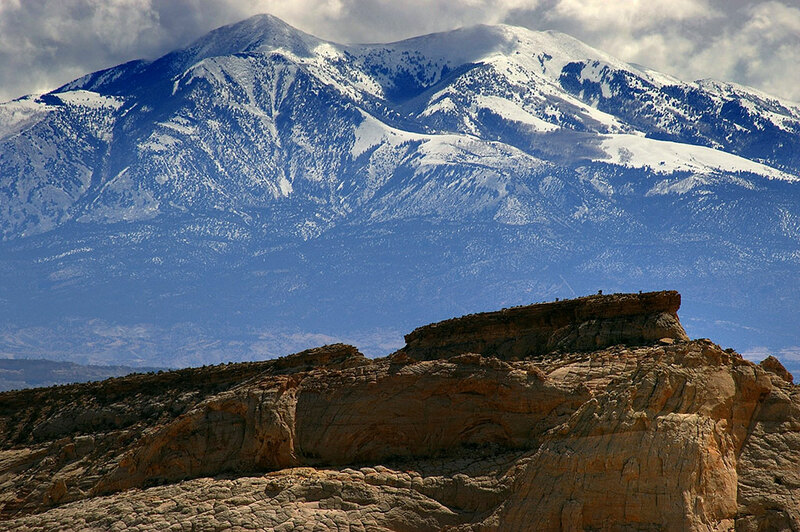 The San Rafael Reef marks the eastern edge of the San Rafael Swell, seen in this view from Interstate 70 looking south. Rain was almost continuous in the morning. 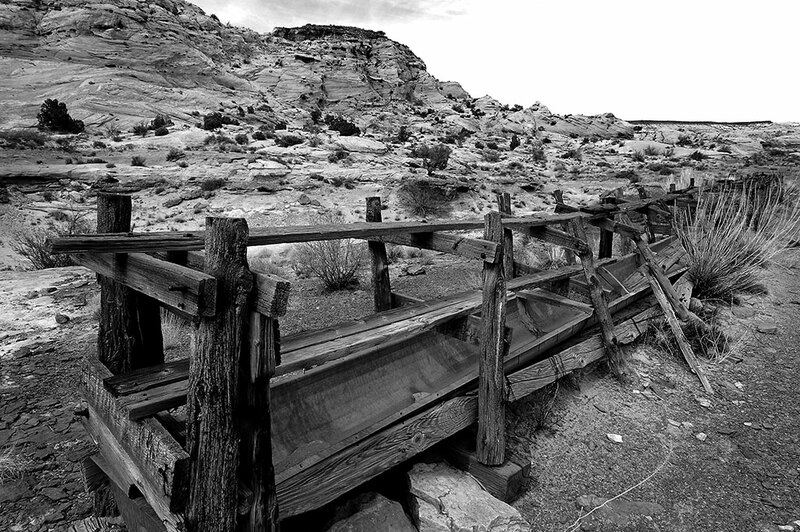 A spot of sunshine tempted me out in the afternoon, so I drove to Sego Canyon near Thompson Springs, Utah, a fairly deserted settlement. 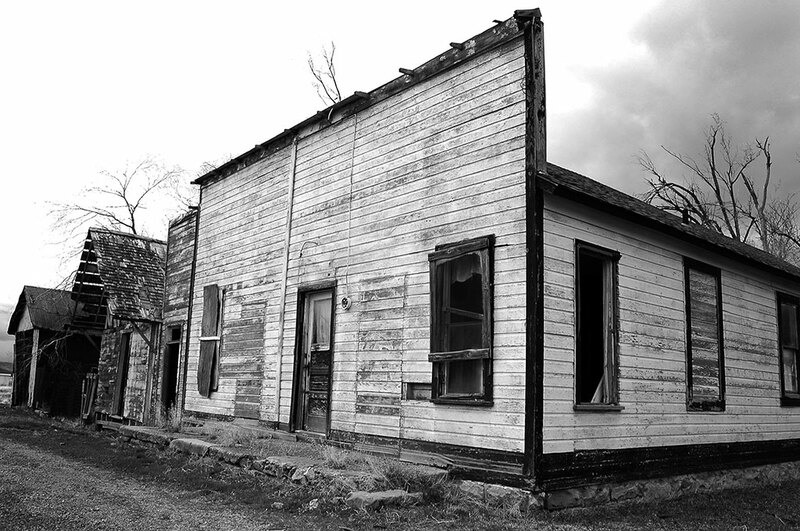 Thompson Springs, Utah, was largely abandoned. 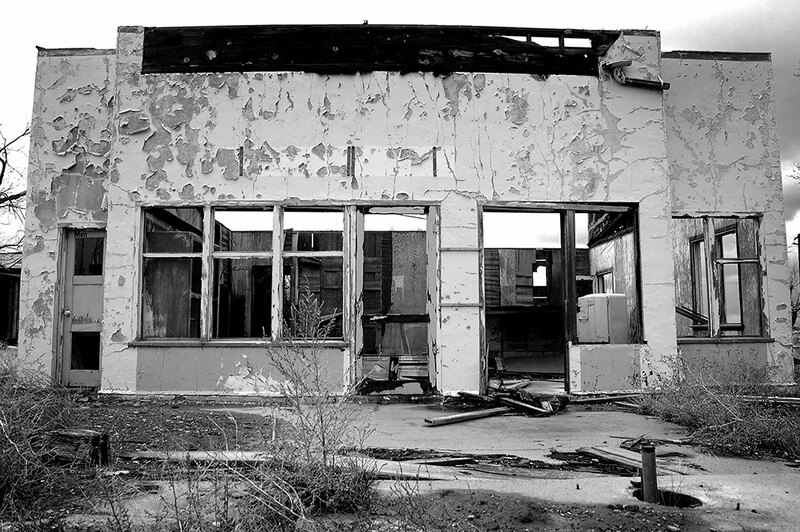 Thompson Springs, Utah, is verging on being a ghost town. Most of the structures I saw there were like this. In the process of searching for the Sego Canyon petroglyphs, I managed to get my car stuck in some surprisingly slick, deep mud on a road that looked drivable. After trying for several minutes of trying to coax my car out of the mud, I walked about a quarter of a mile to a cemetery, where I’d noted passing a car with a couple of people in it. I asked them if they could help me get my car free, and one of them told me, “I can’t. I just hurt my back.” I didn’t really believe him. After several more tries and giving up again, and with my shoes covered in an inch of filth, I finally coaxed my car out of the mire with a combination of my Pontiac’s traction control, built-up mud on the tires, and rocking the car back and forth. 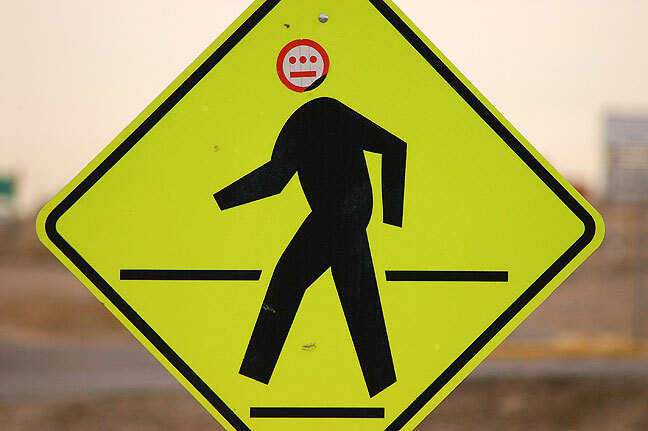 It turned out I had overshot the petroglyphs, and they were on the paved road I had left behind. 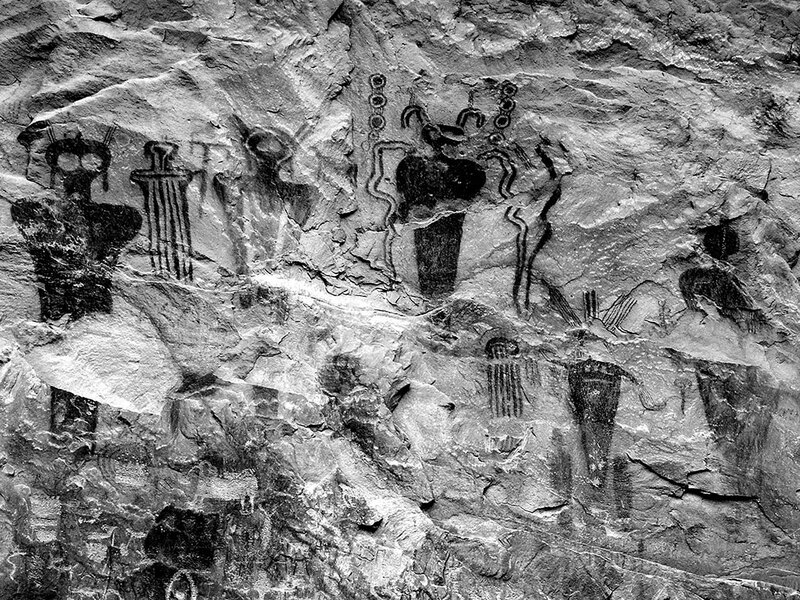 These are the Sego Canyon petroglyphs I was trying to find. I drove right past them and got my car temporarily stuck in some tenacious mud. 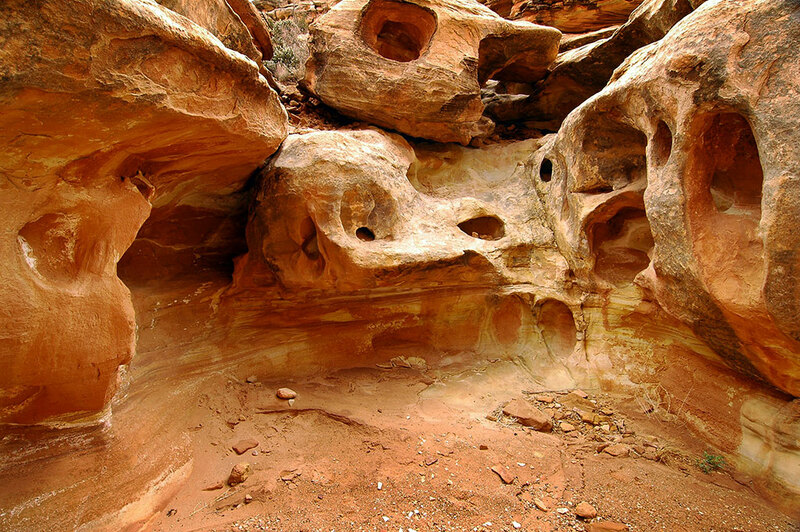 This is one of the handsome cliff faces of Sego Canyon. 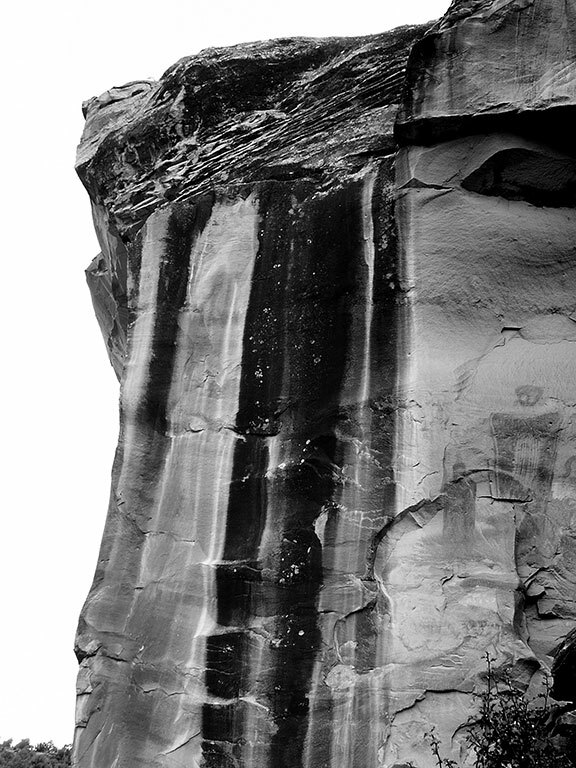 You can see a petroglyph in the right side of the image. I drove right past this on my way to getting stuck in the mud. 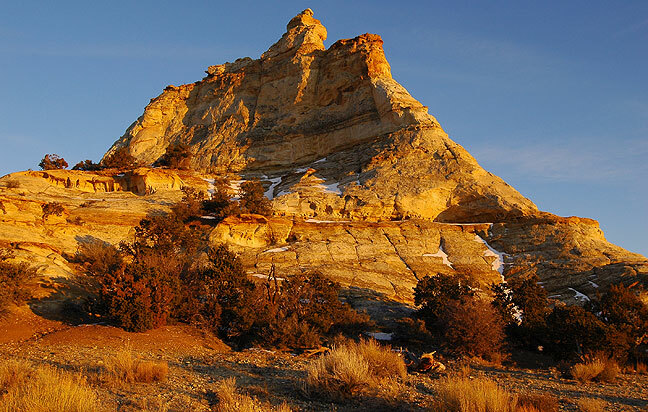 I was up before dawn and out the door in Green River, Utah, in time to shoot a lovely sunrise at the Book Cliffs north of town. 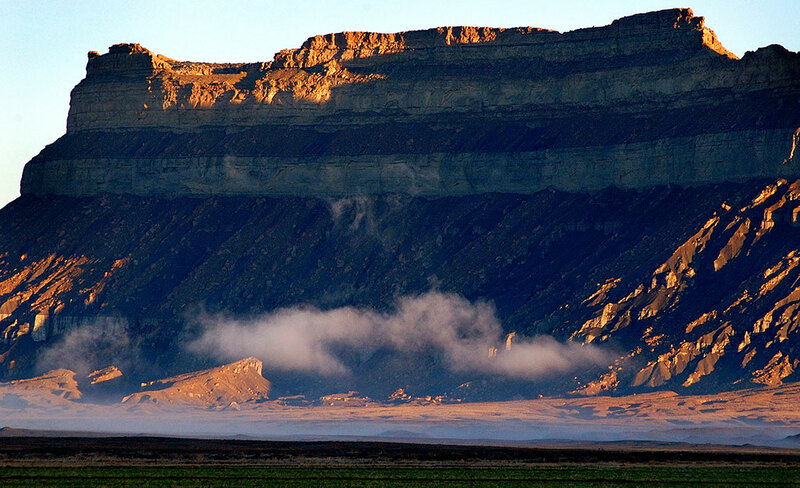 Early light and fog tags the Book Cliffs near Green River, Utah. 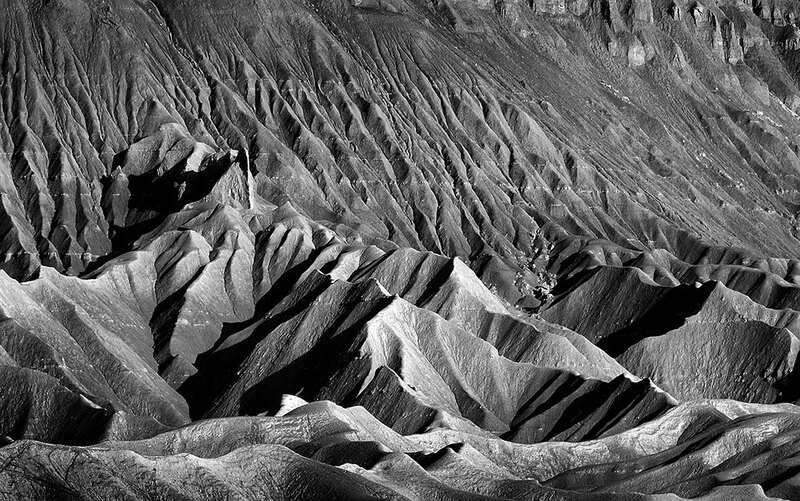 The Book Cliffs near Green River were repeatedly obscure and revealed as I photographed them early in the morning. 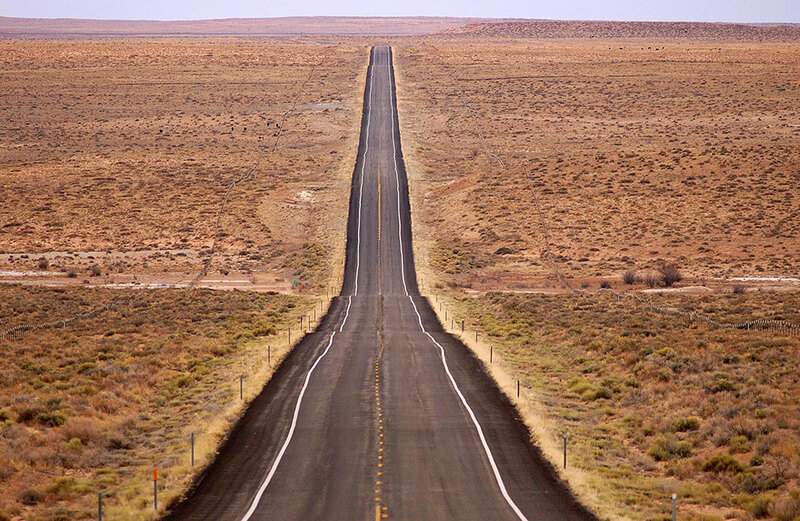 This view looks south along Utah 24 in the lonely San Rafael Desert. Factory Butte shines in welcome morning sunshine on my way to Capital Reef. 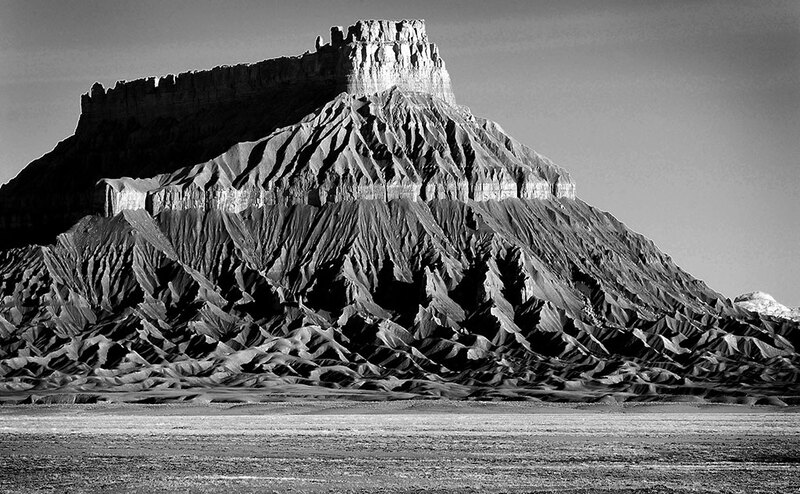 The erosions of the desert southwest never fail to amaze me or my camera, as in this image made en route to Capital Reef. 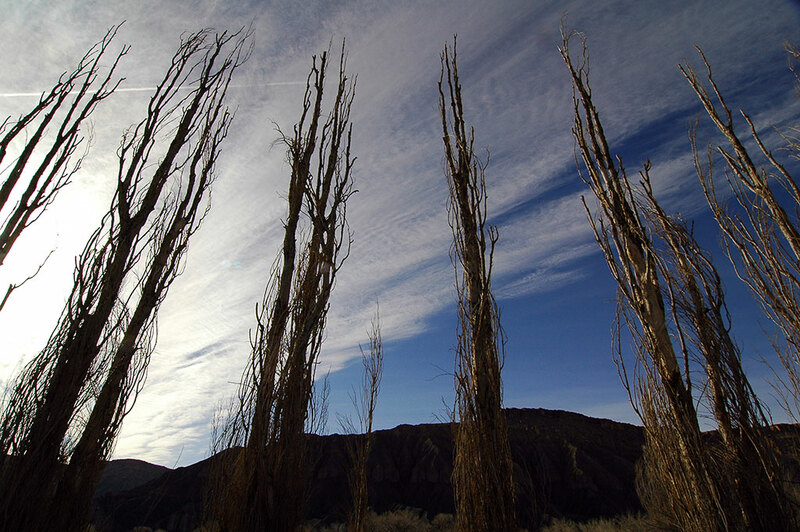 Cottonwoods cling to the banks of the Fremont River near Caineville, Utah. 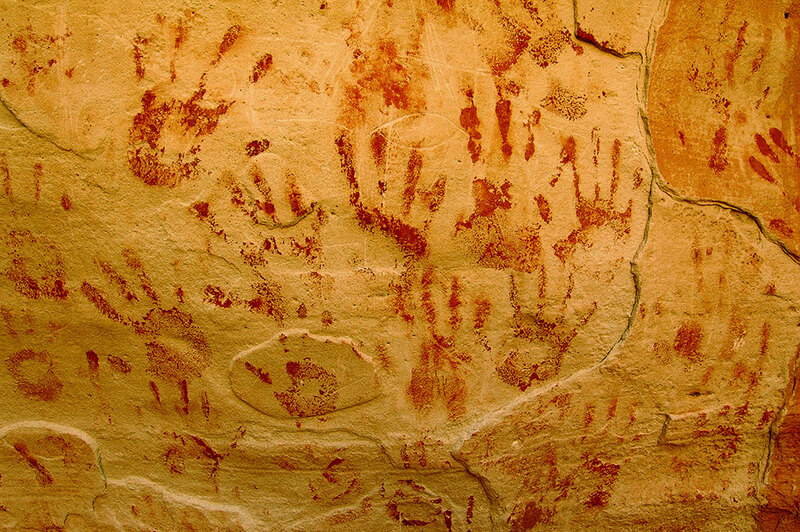 I photographed these handprints in an alcove near a small natural bridge on the route to Hickman Bridge. 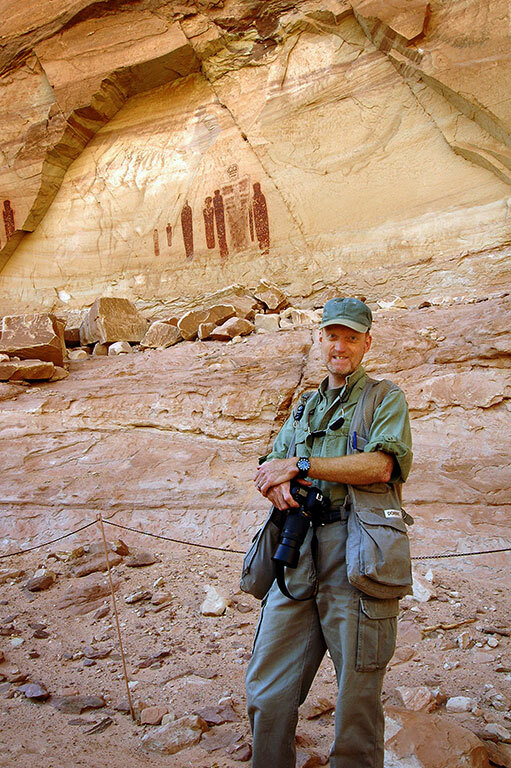 I encountered perfect weather and excellent hiking at Capitol Reef. 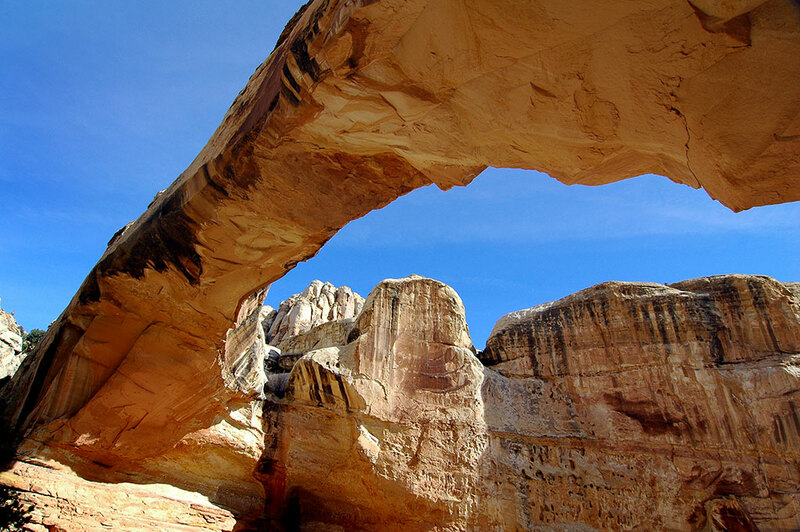 I started the day with Hickman Bridge, an impressive natural arch at the end of a short spur trail. 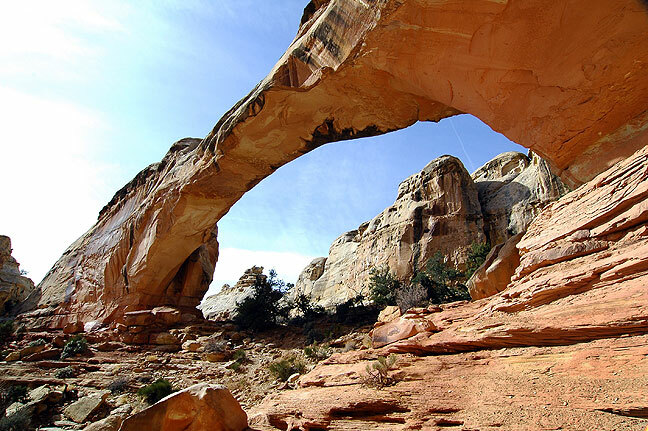 A spur option from the Rim Overlook trail at Capitol Reef leads to the large and impressive Hickman Bridge, a natural arch which measures 72 feet high and 133 feet in span. Hackman Bridge is impressively and even surprisingly large. 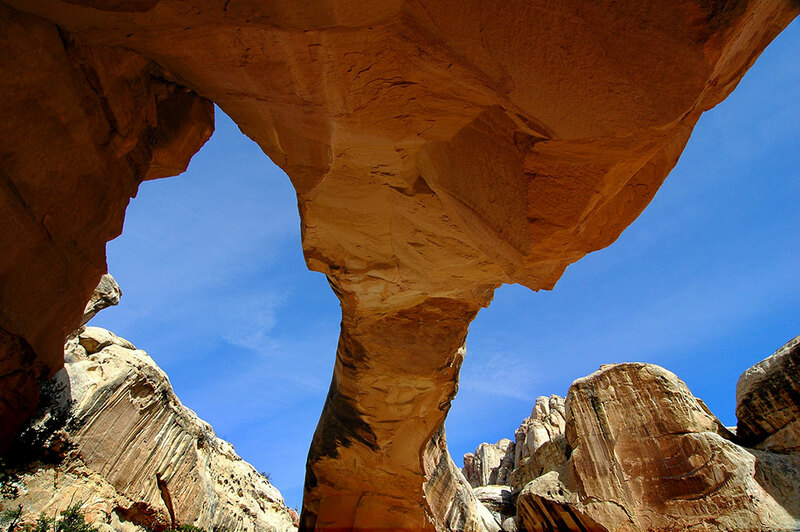 This view was made from directly below the arch of Hickman Bridge. 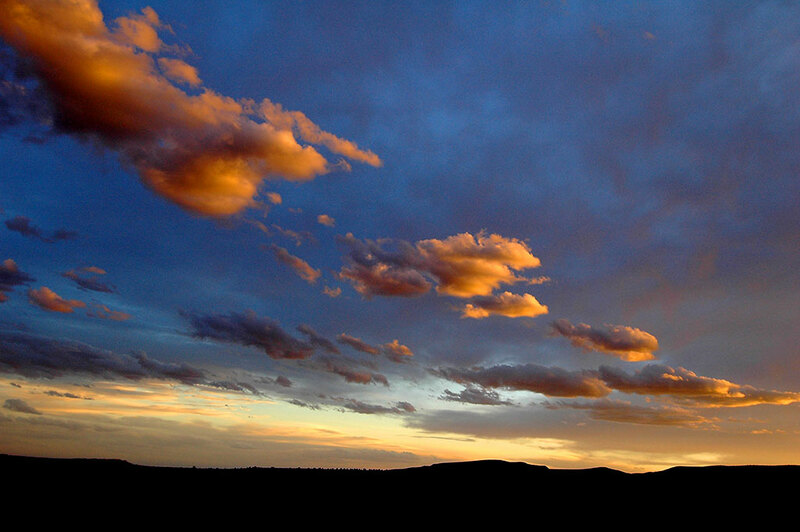 On my way up to the Rim Overlook, I made this image of clouds over the Henry Mountains. Beyond the spur trail was the Rim Overlook Trail, which led to excellent views from the top of the park. 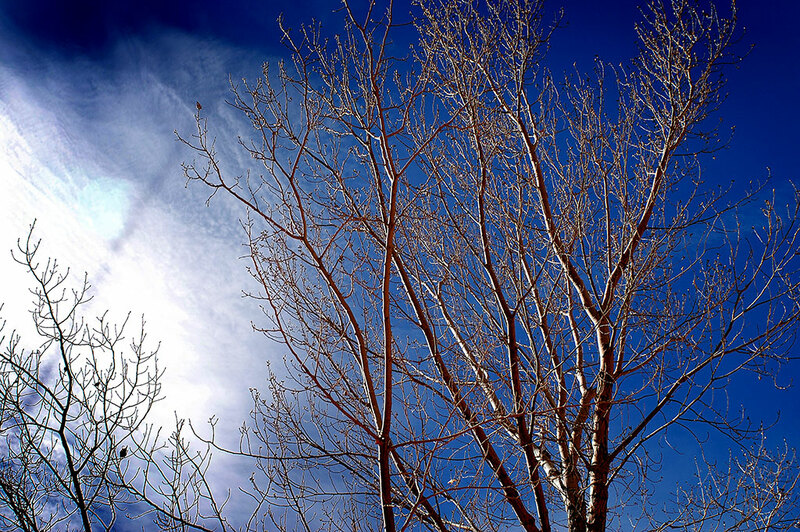 The weather remained cool and dry, with beautiful sunshine. 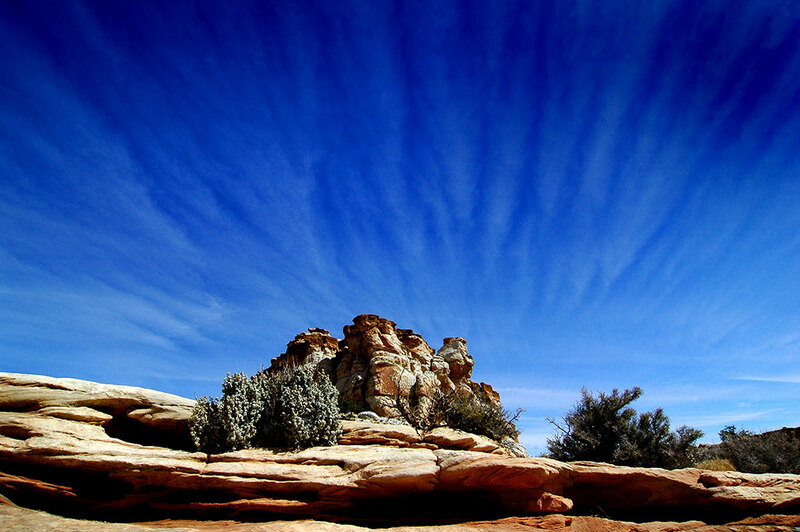 Near the crest of the Rim Overlook, I encountered these subtle cirrus clouds. From the edge of the Rim Overlook, you can see the road and visitors center 1500 feet below. 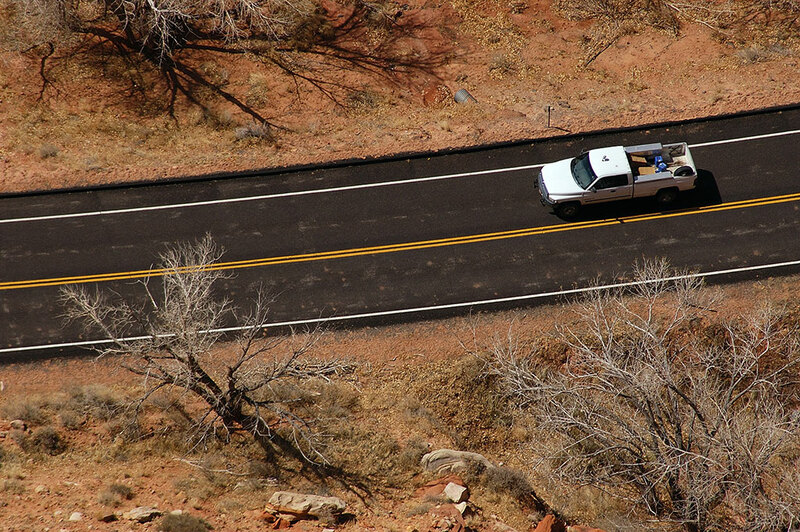 A vehicle passes on the roadway 1500 feet below. 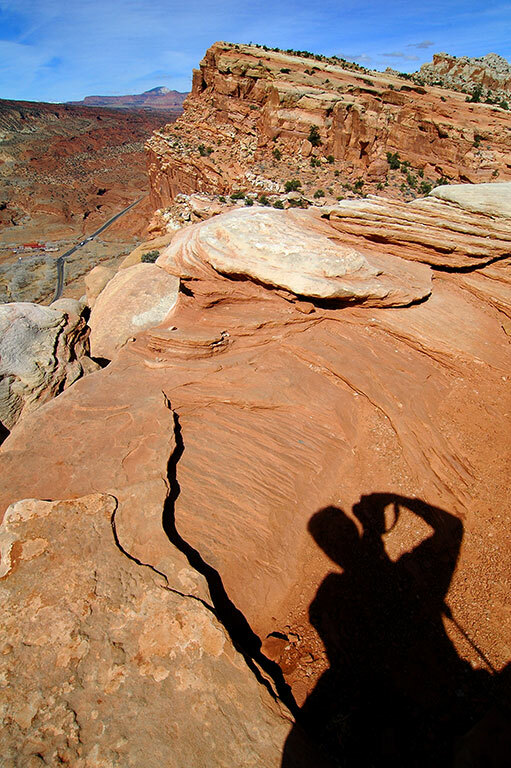 I made this shadow self portrait looking west at the Rim Overlook. 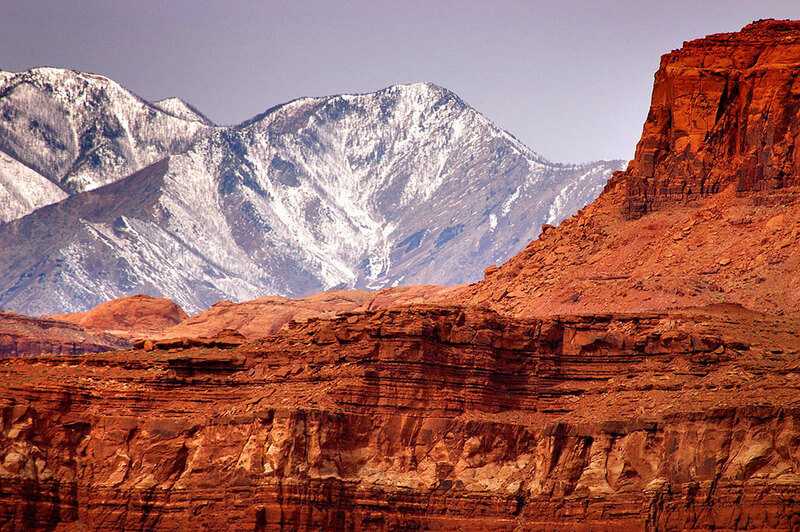 This view shows some of the formations of Capital Reef set against the Henry Mountains to the east. 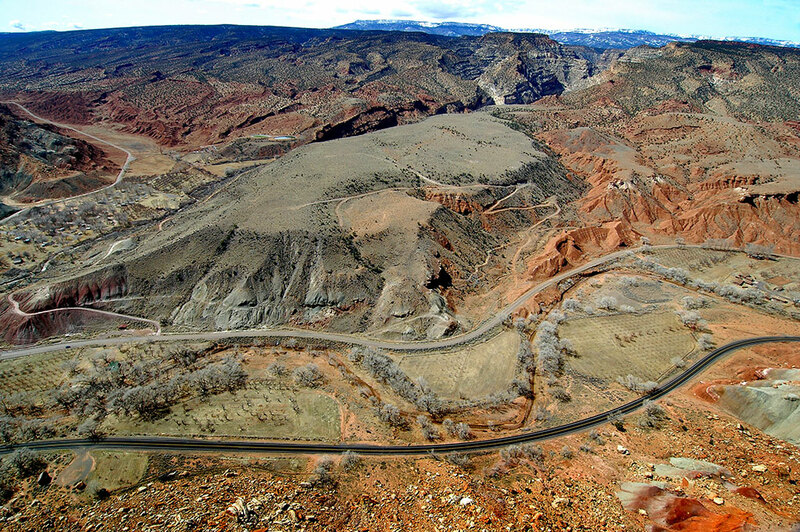 Looking down from the Rim Overlook, roads are visible to the west. 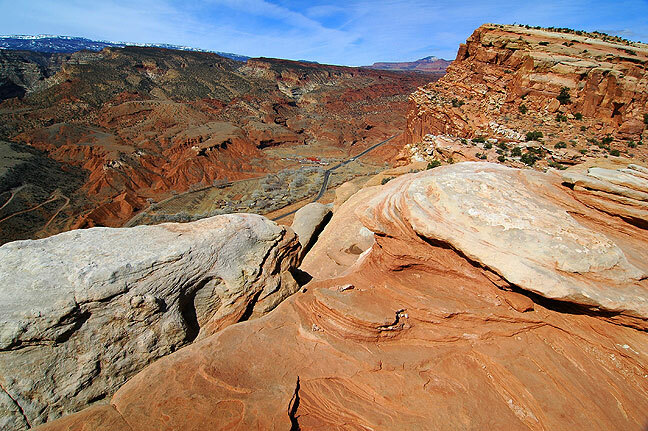 This wide angle overview from the Rim Overlook shows the expansive view of Capital Reef looking south. Your humble host poses for a self portrait during a rest break at the top of the Rim Overlook Trail. 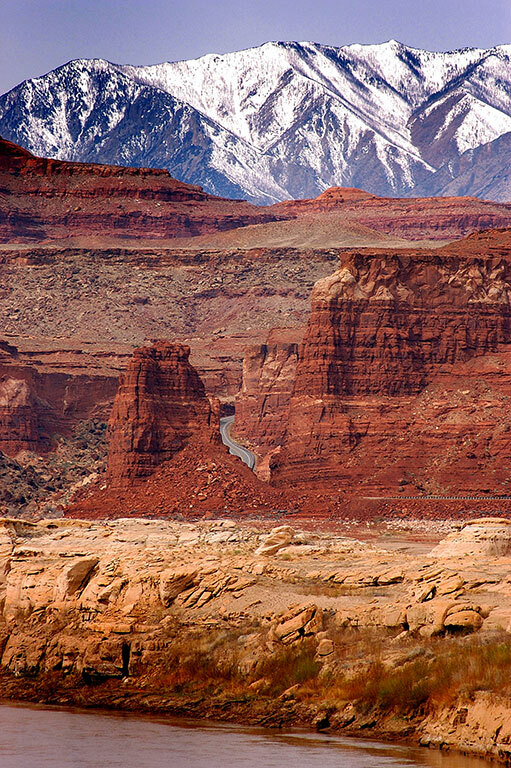 This view looks east from Capitol Reef’s Rim Overlook Trail, showing the Waterpocket Fold and, in the distance, the Henry Mountains. 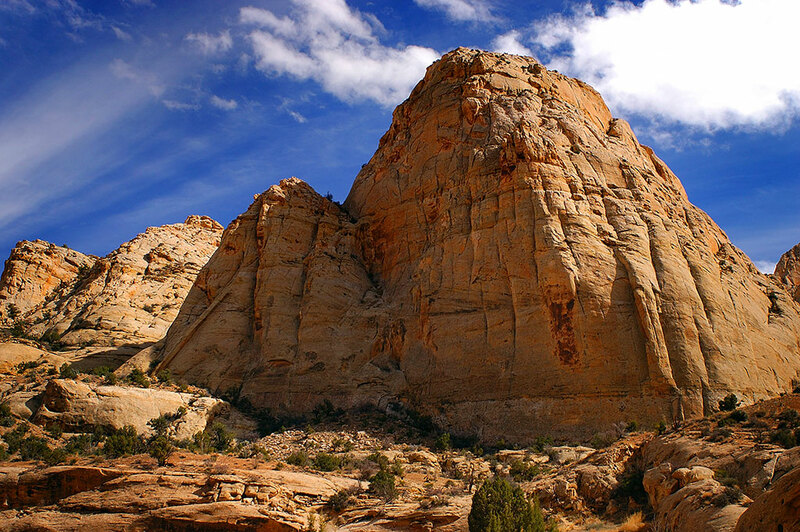 Driving south for a few miles revealed this handsome boulder and cliffs at Capitol Reef. 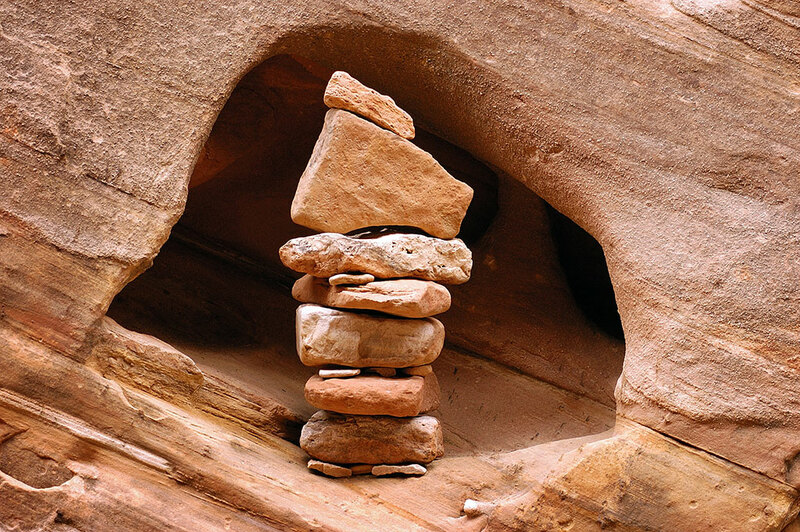 Trail cairns in creative places or built creatively always amaze and amuse me, like this one along the Grand Wash trail. For some of the afternoon, I hiked the Grand Wash Trail, and though it was interesting and scenic, I found it fairly unchallenging. The sky and sunshine were nice along the Grand Wash trail, but the hike itself was unchallenging. Grand Wash was beautiful, and I am glad I saw it. I arrived at this alcove at the end of the Grand Wash trail, which was either the end of the trail, or a good spot for me to turn around, which I did. 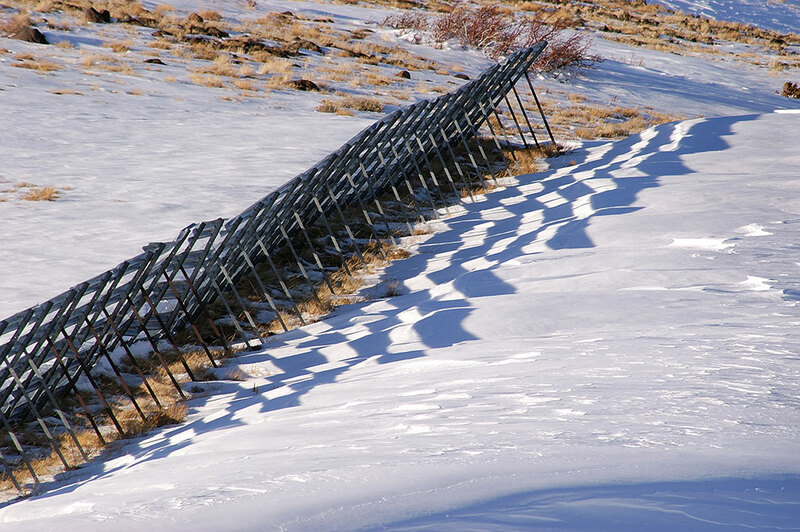 Utah 72 took me above the 8000-foot snow line, where I enjoyed brilliant sunshine and these pristine snow fields. 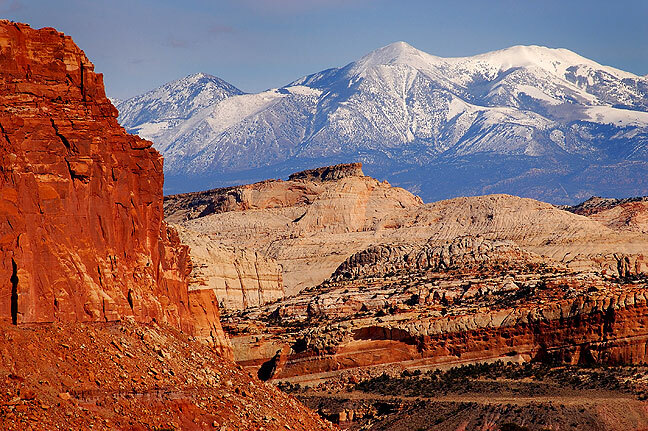 After making mental notes of all the rest of Capitol Reef I want to visit, I took the long way back to Green River, through a mountain pass in the Fishlake National Forest, which took me above the 8000-foot snow line. 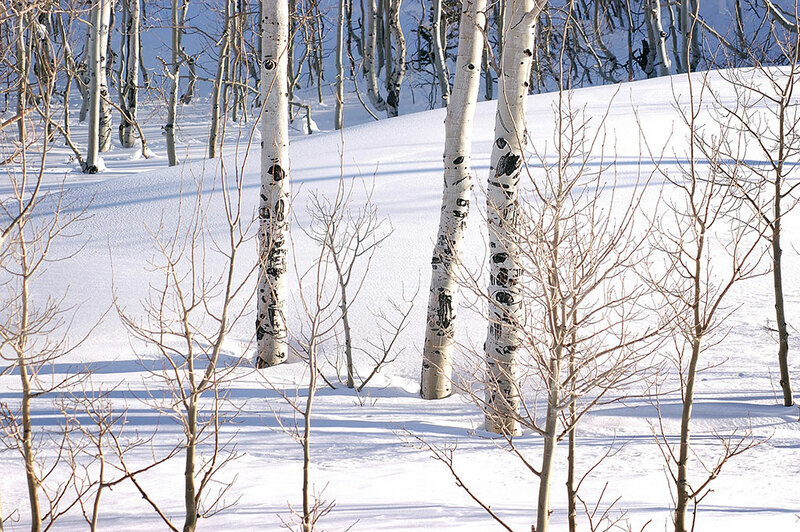 I photographed this nearly perfect snow field in brilliant sunshine near Deer Peak along Utah 72. 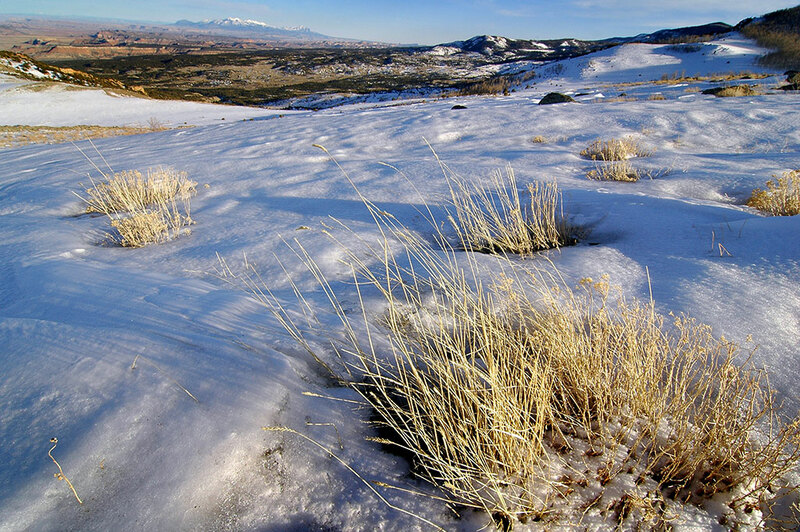 This wider view of the snow field in near Deer Peak along Utah 72 shows the Henry Mountains in the distance. 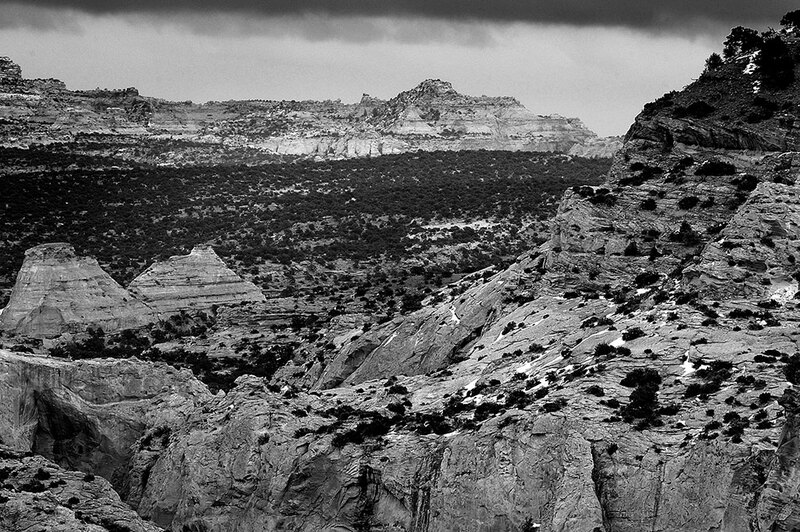 Finally, I drove across the San Rafael Swell on I-70. 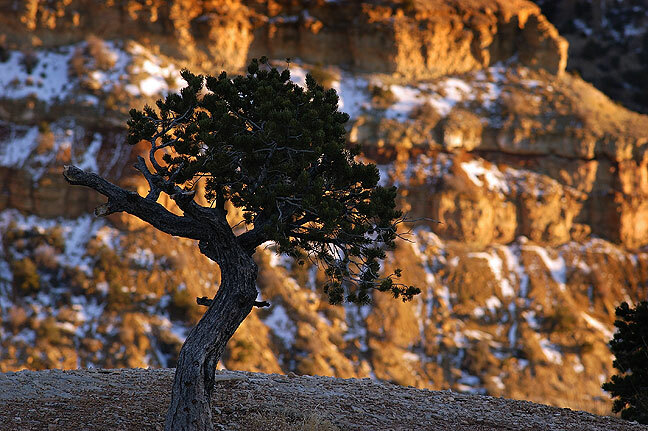 A tree in lingering snow a silhouetted against Eagle Canyon on the San Rafael Swell, Utah. 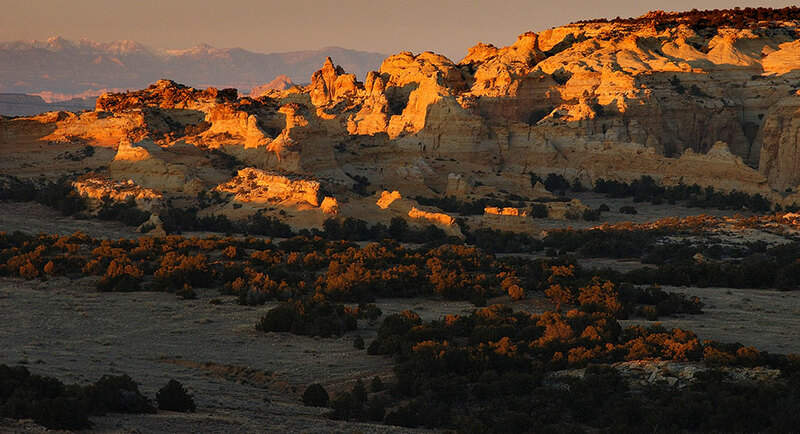 The San Rafael Swell takes on a deep amber tone as sunset approaches. 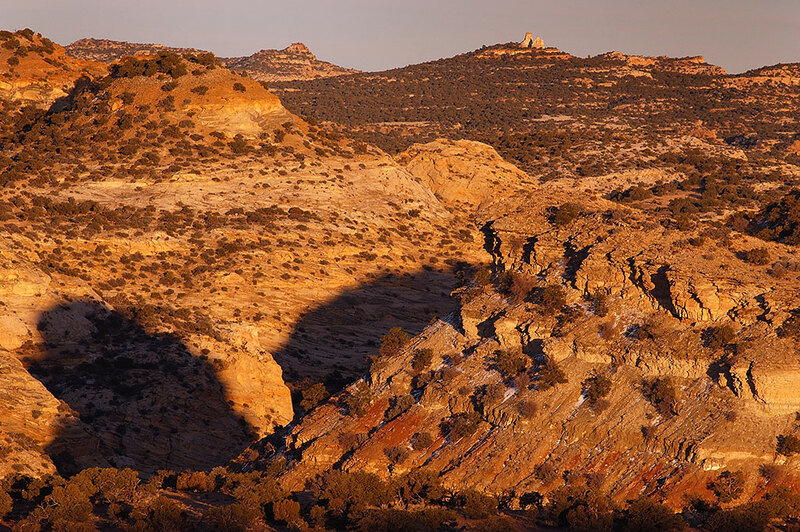 Pinnacles of the San Rafael Swell shine at last light near Eagle Canyon. 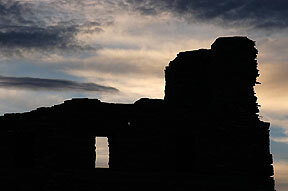 The Abó Ruin is silhouetted against the evening sky. Mostly a driving day, making my way from Green River, Utah, to Socorro, New Mexico. 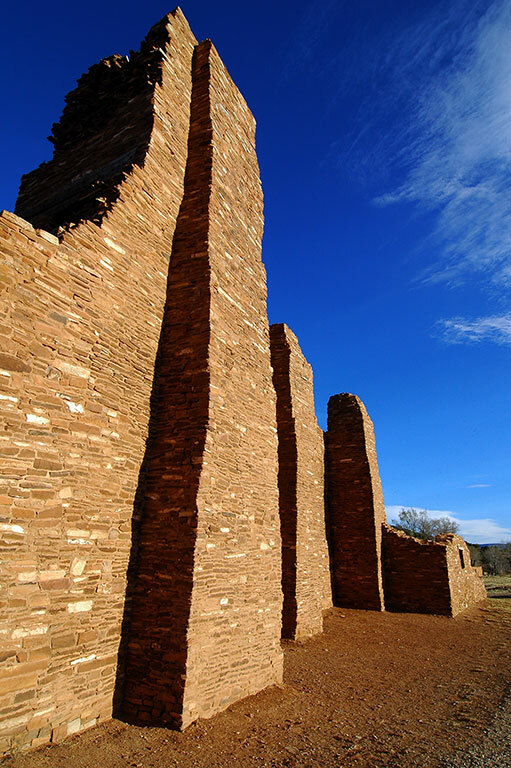 I was able to make a few neat images along the way, and I finished the day at the Abó Salinas Pueblo Missions National Monument near Mountainair, New Mexico just before sundown. Day five was mostly a driving day. 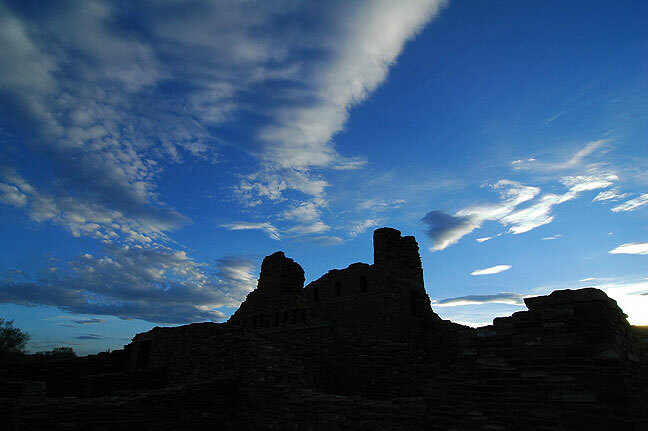 I drove from Green River, Utah, to Socorro, New Mexico, stopping on the way to photograph the Abó Ruin in the Salinas Pueblo Missions National Monument at sunset. 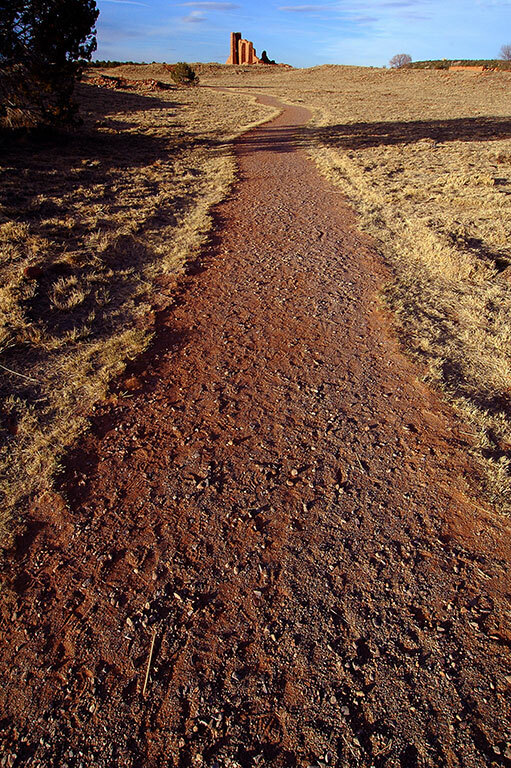 A lightly paved trail leads to the main structures of the Abó Ruin. 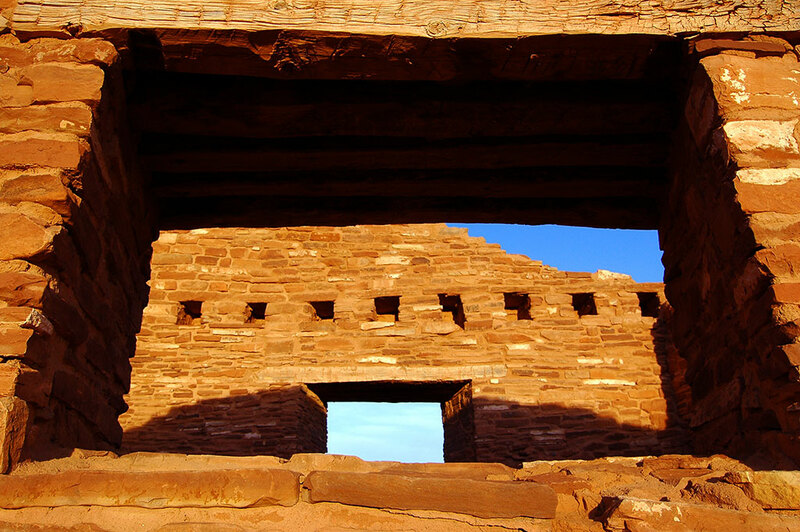 Puebloan windows are, in my opinion, one of the most striking elements of the architecture. 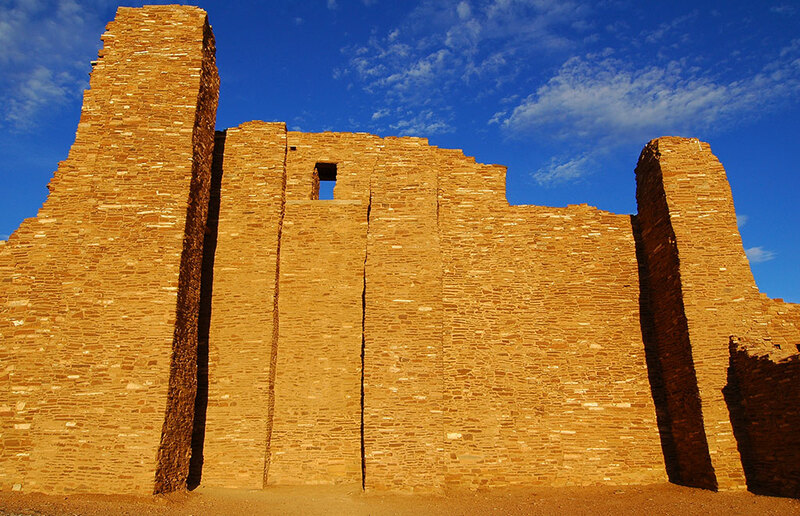 The Abó Ruin of Salinas Pueblo Missions National Monument stands tall in clear afternoon light. By the time I arrived, the visitors center was closed, and I had the place to myself. The handsome masonry of the Abó Ruin shines in later afternoon sunshine. This broad view of the Abó Ruin shows the handsome lines of this architecture in maturing afternoon light. 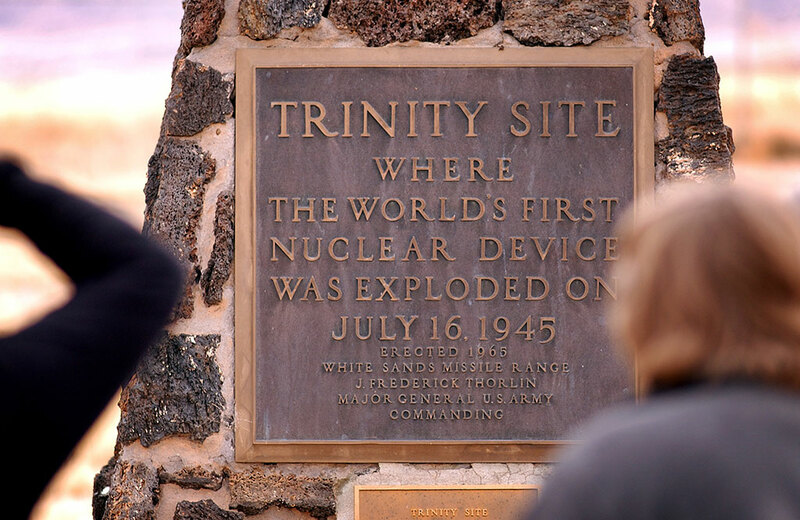 The Trinity Site is where the first atomic bomb was tested at 5:29 a.m. Mountain War Time, July 16, 1945. 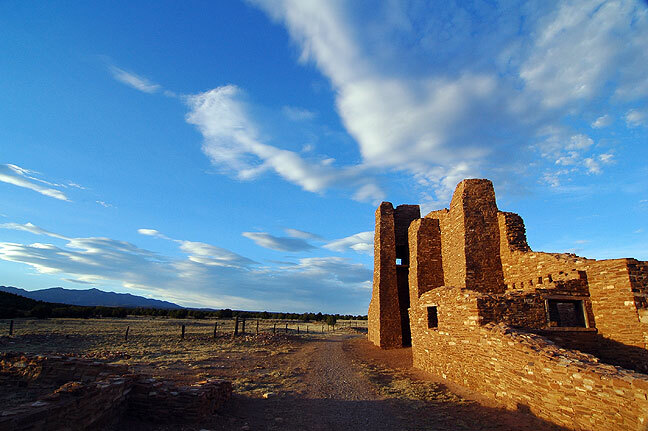 In the middle of the forbidding Jornada del Muerto desert and the White Sands Missile Range, the 51,500-acre area was declared a national historic landmark in 1975. The Site is open only on the first Saturday in April and the first Saturday in October. No reservations are required, but I would urge visitors to arrive early – there was a surprisingly large contingent of tourists waiting at the Stallion Gate on the north end of the WSMR when it opened at 8 a. m.
The first image on my trip to the Trinity Site was this obviously very old (considering the phone number doesn’t have an area code) warning sign for radio amateurs like me. 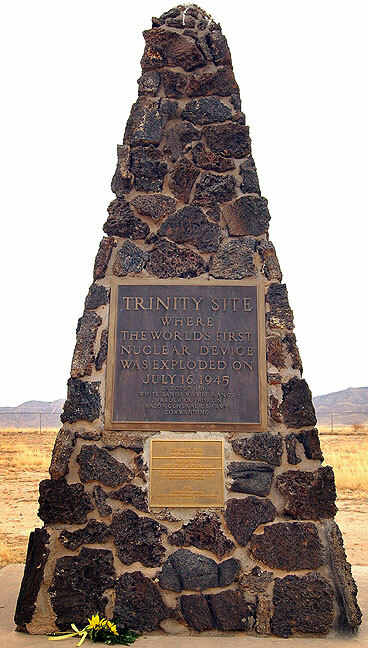 The timing of this segment of my trip was to allow me to visit the Trinity Site, which, as the sign explains, is where the first atom bomb was exploded. 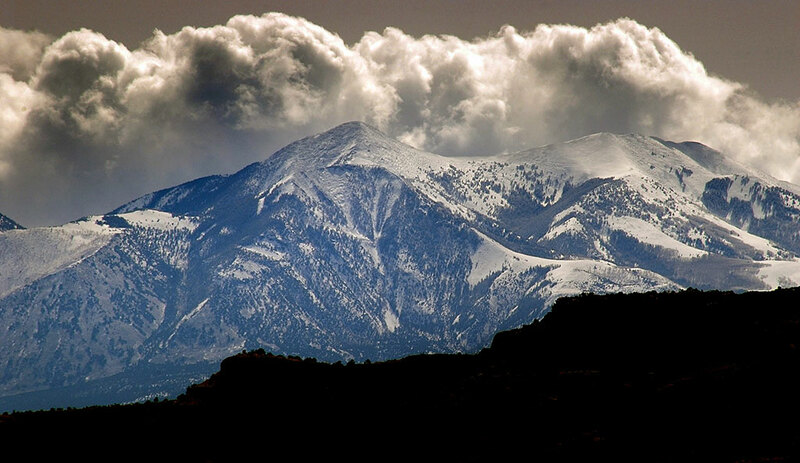 In the middle of the forbidding Jornada del Muerto desert and the White Sands Missile Range, the 51,500-acre area was declared a national historic landmark in 1975. The Site is open only on the first Saturday in April and the first Saturday in October. 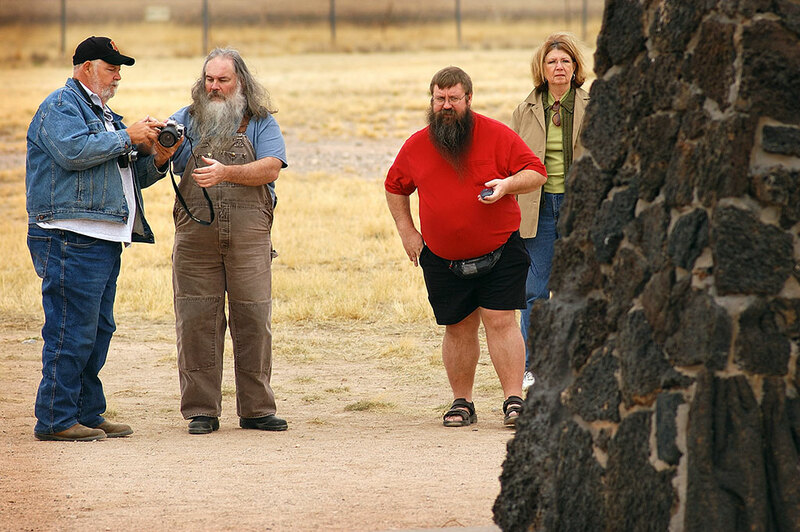 No reservations are required, but I would urge visitors to arrive early – there was a surprisingly large contingent of tourists waiting at the Stallion Gate on the north end of the WSMR when it opened at 8 a. m.
A warning sign hangs on a fence at the Trinity site. 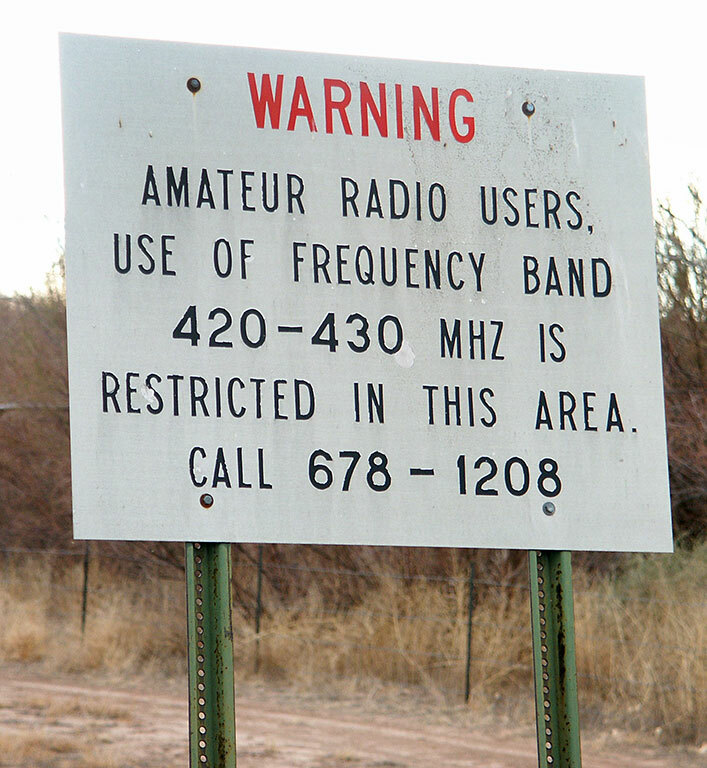 There is no danger of occasionally visiting the site, but one presumes increased exposure to ionizing radiation with repeated visits. 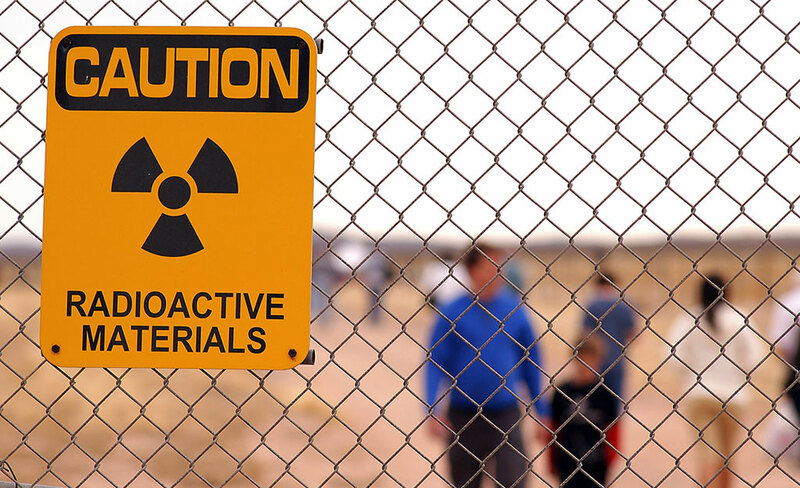 Many of the dangerous isotopes, however, have long since decayed into stable materials. 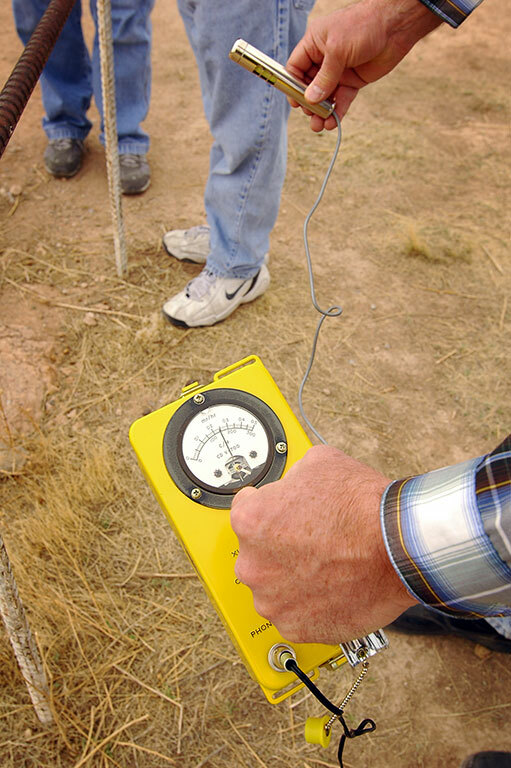 A man uses a geiger counter to measure remnant radiation at the Trinity Site. 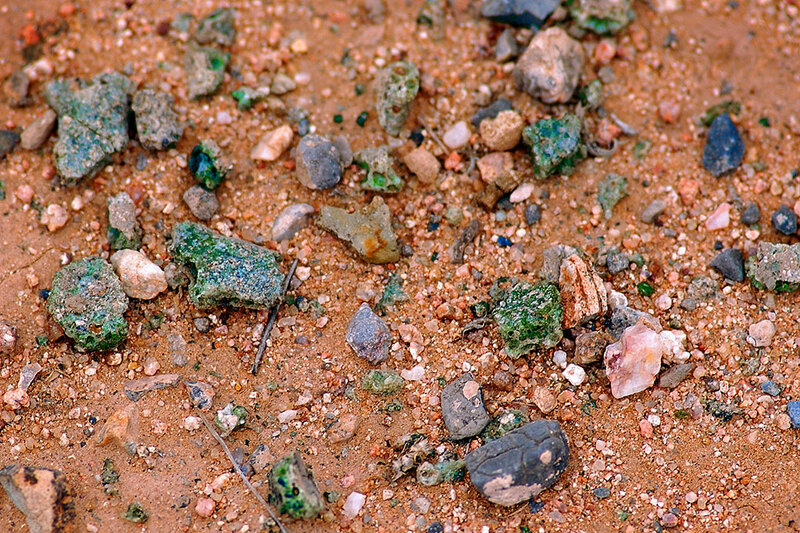 The area around the explosion of “The Gadget,” as the first atom bomb was called, is littered with a stone called Trinitie, created by superheating sand into glass. 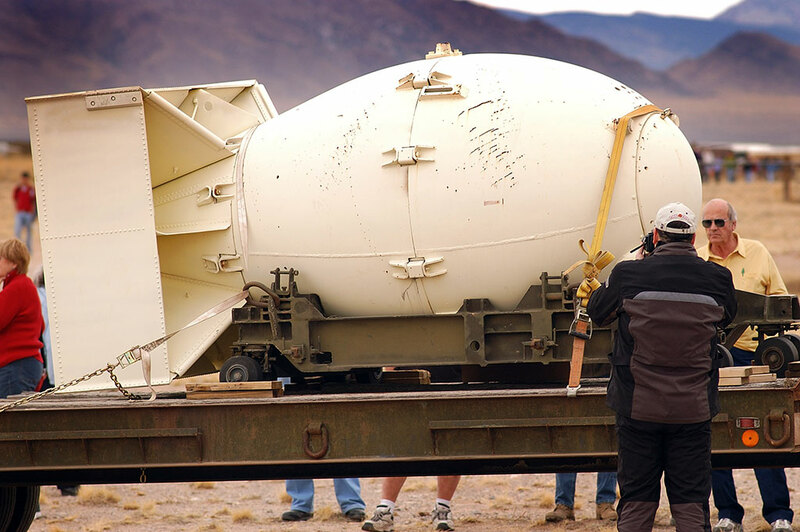 The Air Force brings out this replica of “Fat Man”, the weapon that was dropped on Hiroshima. 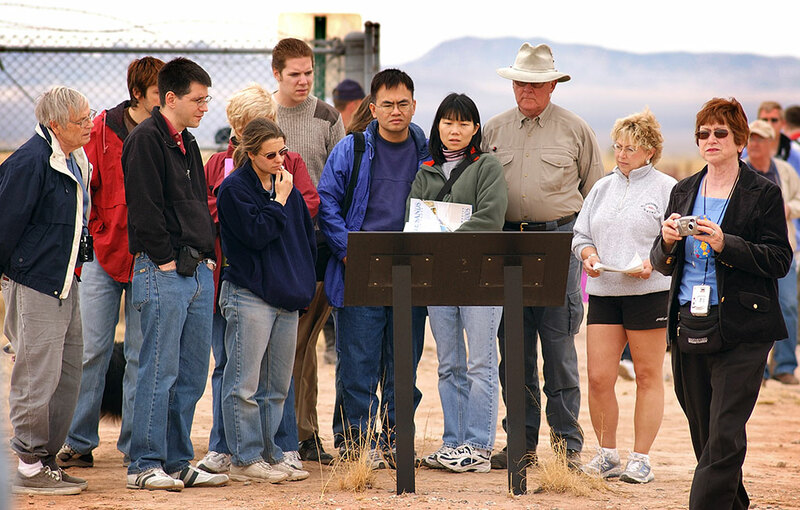 A group of tourists read a kiosk at the Trinity site. 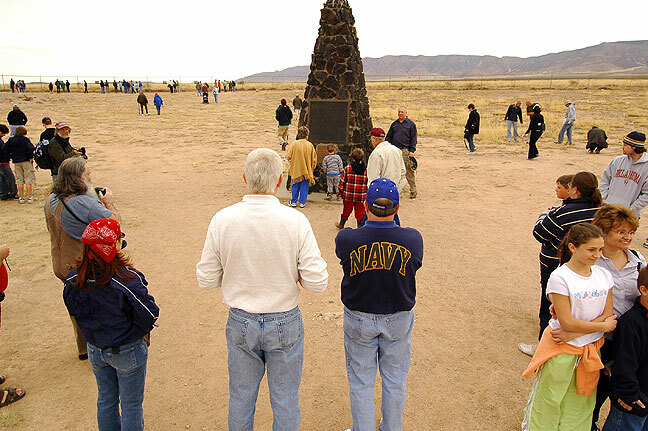 Visitors photograph the marker at the Trinity site. 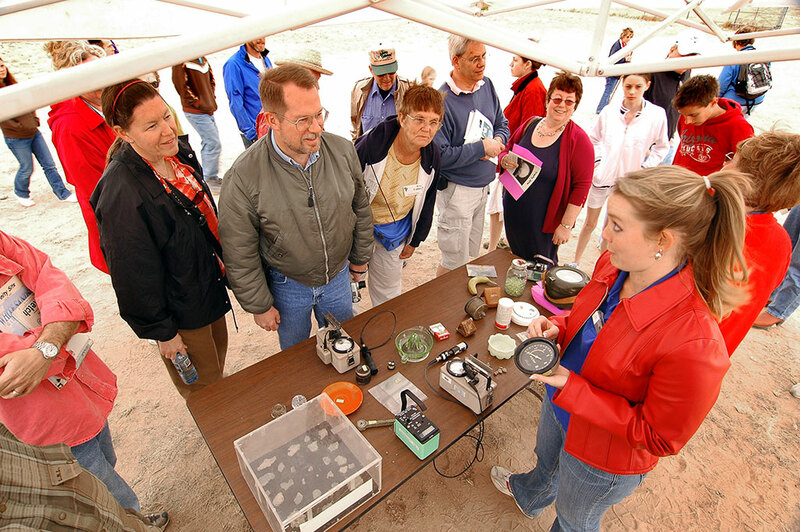 The twice annual Trinity site schedule becomes a cottage industry of its own, featuring kiosks where people sell Trinitite, take Geiger counter readers, and compare radiation levels of household items to the background radiation at the site. It’s quite a show. The Trinity site itself is a very unremarkable piece of desert, but I liked seeing this slice of history. 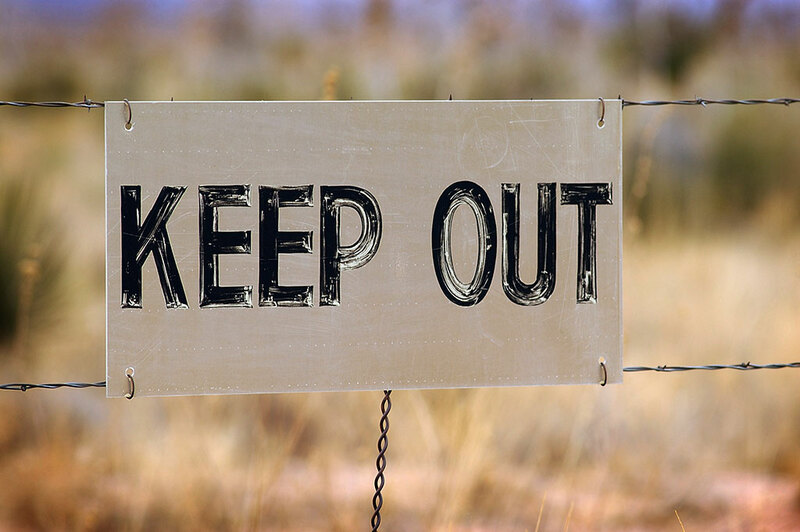 A very well-worn “keep out” sign hangs on a fence at the Trinity site. White Sands National Monument is shown with the San Andres Mountains in the distance. 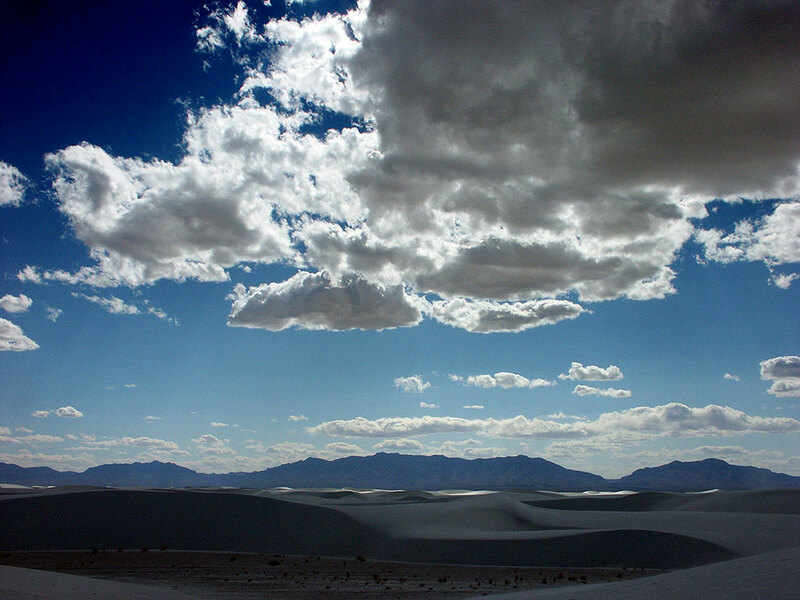 In the afternoon, I had a great time hiking around at White Sands. The wind was up, so I didn’t shoot a lot, but it was a nice, relaxing last day of my vacation. I saw this kite flying in the perfect blue skies above White Sands. 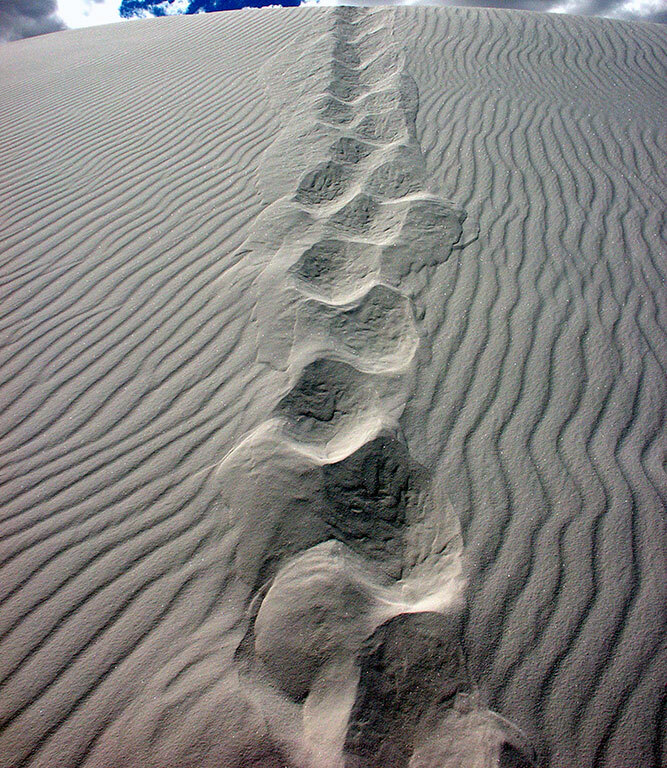 My tracks are visible in the sand at White Sands. Clouds hide the sun monetarily in this view of White Sands with the San Andres Mountains in the distance. 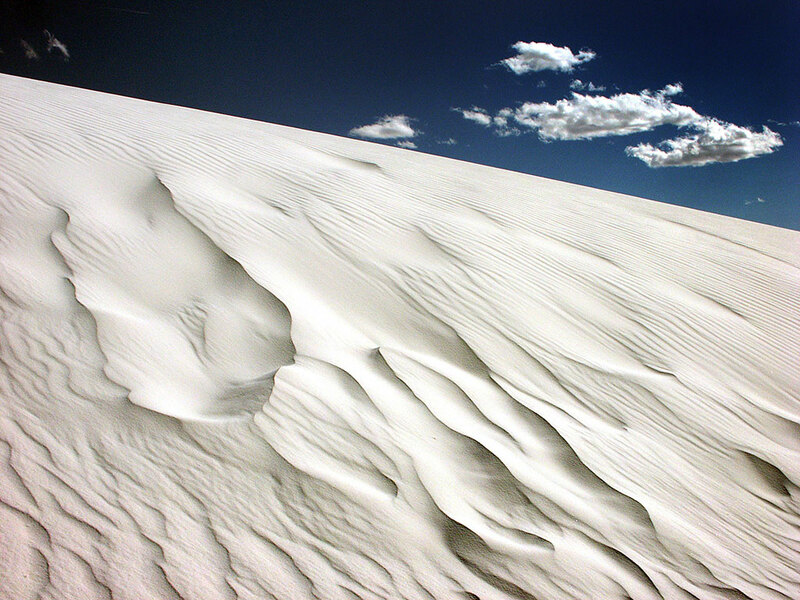 The gypsum sand at White Sands is set against a perfect blue sky. 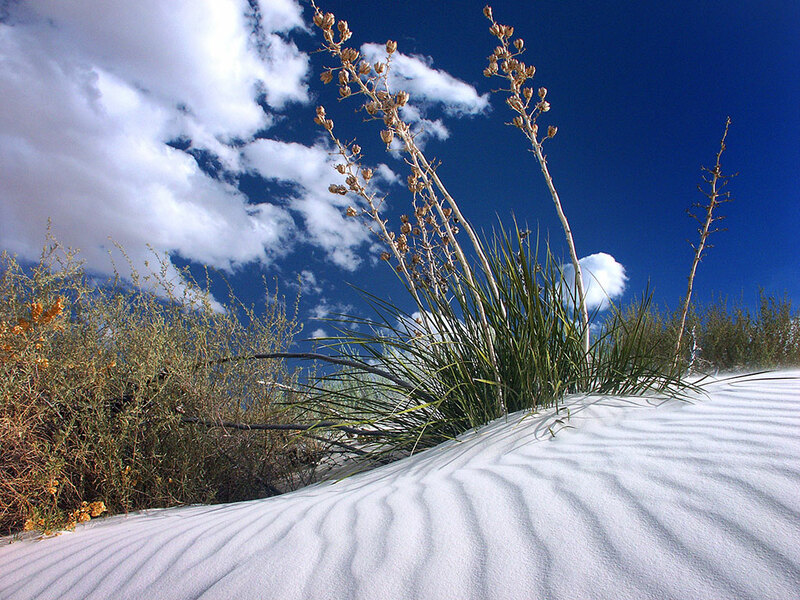 Soaptree yucca slings to the sand at White Sands National Monument, New Mexico. My return to Socorro, New Mexico for the night took me back through the Journada del Muerto Desert, and this spectacular sunset. 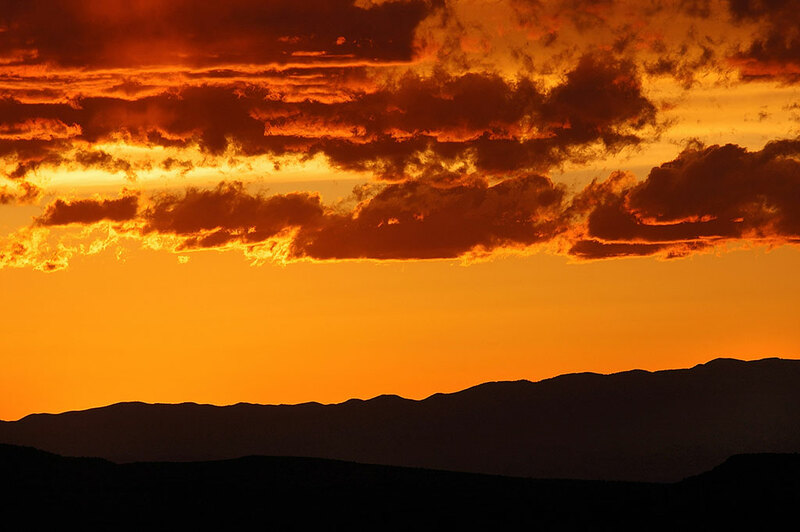 This tighter view of the sunset was made just after the sun dipped below the horizon. 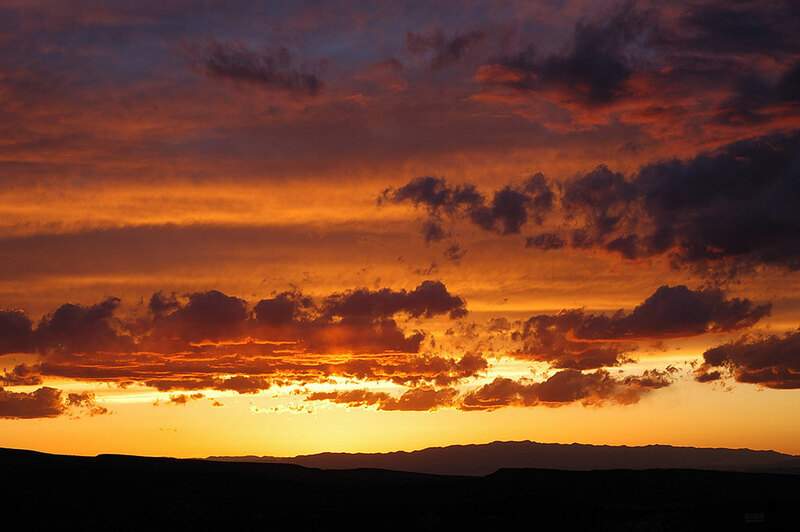 I made this much wider view about ten minutes after the sun ducked below the horizon. I think my favorite is the lightning tree. Did you pick up a piece of that nuclear glass? No, I don’t approve of hoarding history like that. As usual, this travelogue makes me want to stand up from my chair, say “to hell with it,” and strike out west with my camera and just a couple of lenses – I’m thinking the 10-24mm and the 35mm. Some of you best work ever. These locations compose the entirety of my bucket list. After a year, my favorite hasn’t changed. But today I wondered as I scrolled through again: “How long before the whole world looks like this?